What is the Measure of Success in Learning? 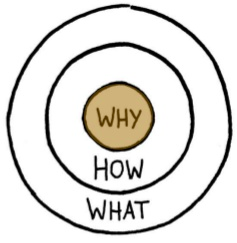 Lately I have been distracted in my thinking after reading a thought provoking post by Maddison Cooper called ‘How Do I know That My Inquiry Has Been Successful?‘ After initially reading the article I spent a considerable amount of thinking about this very question. What does a successful inquiry look like? Like Maddison I was inclined to think about the stance taken within the pages of ‘Making the PYP Happen’ in which it states ‘successful inquiry will lead to responsible action’ (Making the PYP Happen 2009). It seemed an open and shut case but the question of success has continued to bother me. In my understanding, true inquiry should be an ongoing process with no definitive beginning or end. True inquiry should be a continuous cycle of learning, process, evaluation and reflection. What if a child took no immediate action as a result of learning? If the process of inquiry is ongoing then how can Action, regardless of its merit, be the cursor for a successful conclusion? Student Action may also be immediate or it may only become evident weeks, days or even years after we have concluded our learning within the classroom. I have been more inclined to believe that immediate student-action, done within the timeframe of learning, is a reaction to the learning rather than a product of it. And so my quest for understanding continues. If I am to be believed that immediate student-action is a reaction rather than product then the only true measure of success of an inquiry can surely be sustainable action? Again, sustainable action may not become evident to the educator some time after the student leaves the classroom and so from an educators perspective we would be unable to measure the immediate success of an inquiry on action alone? I have again started to think about the merit of action and it it cannot fully evaluate the success of inquiry then maybe we have to evaluate the learning process itself? Do we evaluate the success of learning based on the learner coming to a universally accepted correct answer or do we place value on the process of learning itself? Do we have to be mindful that the action may happen within the learner as part of the learning process? I will try to use examples of a world famous learners and inquirers to try to make my point. Charles Darwin, Galileo and Edison spent their whole lives asking questions, observing, evaluating and ultimately driven by learning. All three are fine examples of the learners and inquirers yet had throughout their careers been questioned about their success and failure. What if their conclusions or findings had been fundamentally wrong? Would we judge their success as learners on the conclusion of their work, right or wrong, or would their success be evaluated on their desire to learn, their perseverance, their lifelong learning journeys? I am sure that, regardless of the right or wrong answers, there would be no educator that would consider any of these learners as unsuccessful. My thinking has now come back to considering action again. Very often we consider student-action to be something that can be seen or something that has been done. What if the action comes from within the learner itself? A change in mindset? a change in behaviour? Creating a joy for learning, a desire to ask questions, demonstrating curiosity and wonder, to seek answers, to actively participate in the learning process without fear of being wrong but looking for an answer that makes sense to them. Is this not the real measure of success in learning? In conclusion, the success of our teaching should be based on our ability to inspire our students to become lifelong learners, curious and empathetic about the world, seekers of knowledge, communicators and collaborators, fearless about being wrong or making mistakes. Success of learning should be evaluated on the students ability to take ownership, desiring change and understanding. The change may come in the form of something big or something small. It may change the world or we may help a friend. When I think of success in these terms I think about my Early Years class and how successful each and every one of them are each and everyday. We are all born scientists and explorers without the preconception that we might be considered wrong or fail. We are all happy and enthusiastic to be part of the learning process rather than driven by the product of learning. In my opinion this is the real measure of success and it is our duty as educators to continue to support and develop this natural curiosity for learning without restrictions throughout their journey. An emerging ‘norm’ within many of our global educational facilities is the growing diversity of our students. 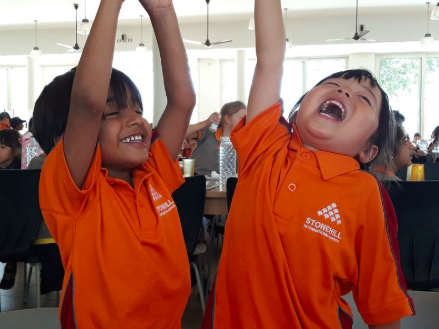 Classrooms are becoming a tapestry of culture, beliefs, traditions and thinking and as a result our students are becoming increasingly culturally and linguistically diverse. The change in demographics for some can be unsettling but in truth it provides immense potential, enriching the lives of our students, providing new perspectives and new possibilities. As educators we need to become more culturally responsive in our practices and better prepared to work with a diverse body of students and families. We need to ensure that we create an environment and approach to learning that celebrates the cultural uniqueness of students. To feel welcomed and valued our students need to see themselves and their families represented within the learning. With the ever increasing coming together of global communities the issue of cultural diversity is becoming ever more complex. Third culture kids are no longer are new phenomenon. The cultural identity for many of our children can be a challenging question. Very often we are witnessing the emergence of new and blended cultural identities as our students connect with elements of a variety of cultural practices, beliefs, traditions and identity. It would be terribly wrong to rely on traditional stereotypes in an attempt to define any individual. We must therefore look beyond our own views and perspectives of culture and take the time to understand our students. To learn about them as individuals and their unique understanding of identity. 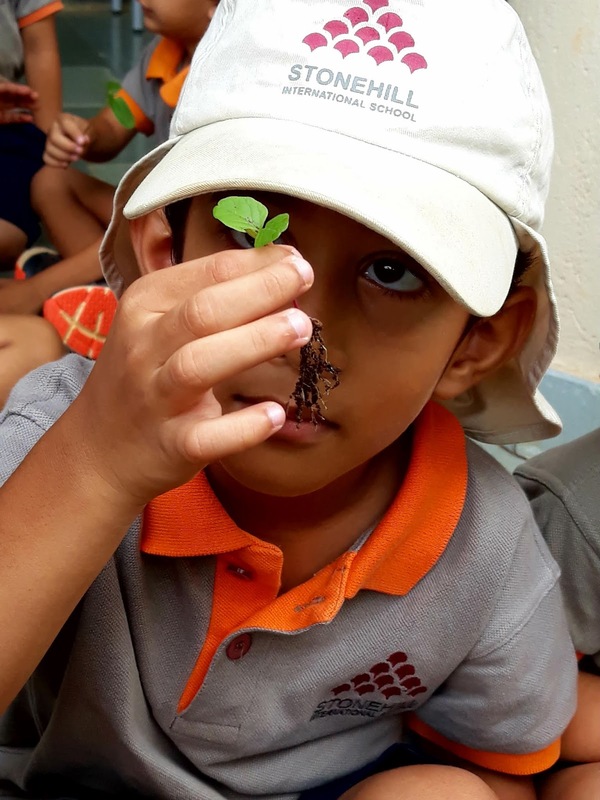 For our students growing up in culturally diverse environment it is important to realise that they are developing a sense of their own cultural identity. Although our students will be influenced by many aspects of various cultures they are introduced to it will be notably the children’s family life that will be the most significant source of that identity. As educators we must find the time to celebrate the culture of the family but we must also be mindful in supporting students to explore their own uniqueness and more importantly develop a secure and positive sense of their own identity no matter what that may be. Cultural diversity is increasingly evident in all areas of education but it is within early childhood education that I believe we can really make an impact. As an Early Childhood educator I recognise recognise that to create a mindset that embraces diversity, equality and change we must begin with our youngest learners. Change must start at a grassroots level. We must take the role of moral compass within the early years setting if we are to genuinely impact positive societal change. As early years practitioners I believe there is a moral and social duty to promote understanding and appreciation of difference and diversity. This includes developing tolerance, respect and promoting cohesion. Diversity and equality in childcare is about validating and cherishing all children, recognising and celebrating who they chose to be. This is just as important for children from the majority culture as it is for those from minority groups. There is also a duty to actively challenge all forms of discrimination. It is not enough to be non-discriminatory in our own practice, we need to be anti-discriminatory, which means challenging others when they make discriminatory comments or act in a discriminatory way. Central to equality and inclusive practice is valuing and having respect for all (Natalie Higgins and Chyrstal Ventura). 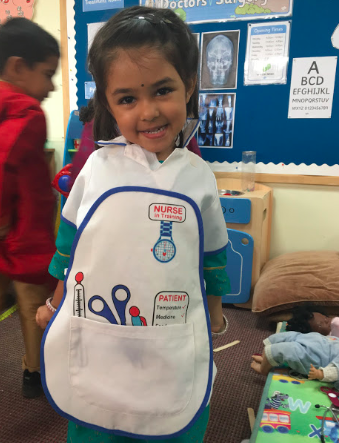 Our young learners are growing up in a diverse society that may be unfamiliar to many of their carers but we have a responsibility to develop their awareness, embrace differences and recognise equality in all. It should be the challenge of all Early Childhood educators to raise children to become culturally competent and sensitive from a young age. It is within early childhood when habitats of life are developed. Research reveals that children are aware, at three and four years and sometimes earlier, of ethnic, ‘racial’, gender, language and physical differences. They notice differences and similarities as part of their natural developmental process and assimilate positive and negative, spoken and unspoken messages about difference. These influences are part of the child’s development of self-identity and self-esteem. Children learn and have their views reinforced by attitudes they experience primarily through relationships with adults and the broader community. Young children enter the childcare environment not as blank slates but with a general awareness of difference. Adults need to acknowledge this awareness and the reality that diversity, equality and anti-discriminatory issues are part of everyday life in the childcare setting. Embracing and working with a diversity and equality approach is integral to the provision of high quality childcare practice (Childcare Strategy). As Early Years practitioners we should observe and listen to children’s play and adult interaction to identify any bias or discrimination, then develop methods to deal with issues that arise. Every aspect of the setting comes into play: how children relate to each other, how staff relate to minority and majority children, how language is used, how and what discussions take place, and what activities are undertaken. Practitioners need the empathy, understanding and skills to help children achieve a positive sense of themselves and of others. Our role: to protect and value all children in the setting, foster empathy and provide accurate information about difference to enable children to think critically about and challenge bias (Childcare Strategy). Child development is a dynamic, interactive process. Every child is unique in interacting with the world around them, and what they invoke and receive from others and the environment also shapes how they think and behave. Children growing up in different cultures receive specific inputs from their environment. For that reason, there’s a vast array of cultural differences in children’s beliefs and behaviour (Ching-Yu Huang). To be able to best make all children feel welcomed and valued it is critical that we create inclusive learning environments that supports all and promotes learning outcomes for all children within the class. For this to happen the children must see themselves and their families represented in not only the learning but also the environment. As educators there is a need to stop and reflect on the best ways to ensure appropriate educational and developmental experiences for all young children reflecting the cultural diversity within the classroom. The unique qualities and characteristics of each individual child must be acknowledged. Just as each child is different, methods and strategies to work with young children must vary. The overall goal for early childhood professionals, however, is to provide every child, including children who are linguistically and culturally diverse, with a responsive learning environment. In order for our children to develop a positive self image it is vitally important that they can see themselves and their family reflected in the learning environment, experiences and resources we provide. We should be constantly mindful of the messages we provide as the learning environment we create for our young learners can provide a message, whether intended or not, as to what we value. It is always important to create a language rich environment but we must be mindful of the messages we send out regarding the importance of one language over another. We should seek opportunities to celebrate the language of each child. This may be as simple as learning how to greet each other in different languages or the labels and posters we place in our rooms. Although the language of instruction may be English we should not discourage but celebrate the variety of languages that are evident within our class. There should be opportunities for children to be able to speak their home language during role-play or on the playground. The issue of home language and its importance to young children is also relevant for children who speak English but come from different cultural backgrounds and may have dialects. This could be especially true for some of our second- and third-generation speakers of English who maintain the dominant accent or dialect of their heritage language. This may also be true for first language English speakers who have an accent that may be unfamiliar to many. In Early Years we must be mindful of the important role books play in the development of our young learners. They are a window to the wider world through which our children see. Often they provide many children their first exposure to different cultures and ethnic groups. Exposing children to a variety of literature from different cultures and perspectives can help them to understand the similarities and differences between different religions, cultures, languages, abilities, sexual orientations, gender and age. Books also allow issues to be raised and stereotypes to be challenged sensitively. Do not just provide traditional books with blond haired princesses and blue eyed princes but the children benefit from stories with characters who look like them. Children can feel excluded if ‘people like me’ only appear in books about ‘children from other lands. The images that we expose our young learners to play a part in shaping their minds and forming a positive identity about themselves. We need to be mindful that the visual images in our classroom environment send a message to even our very young learners. 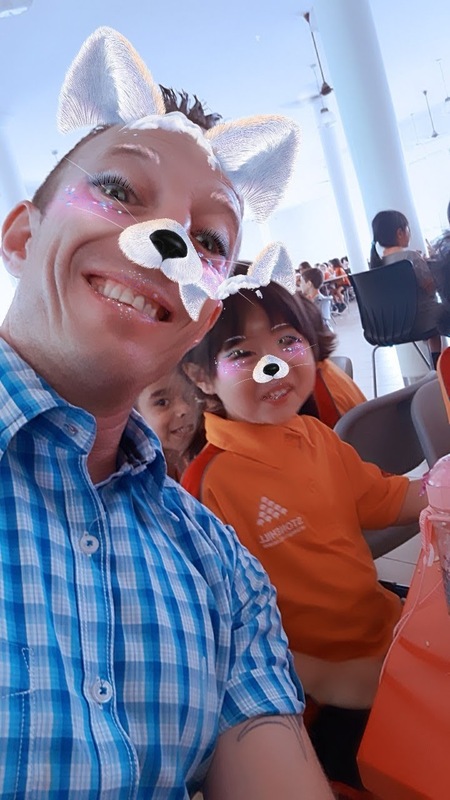 By creating an environment that supports visual images of a variety of ethnic and cultural groups we send a message to the children that all these people who look different in many ways are part of our school and our community. Children also need to see themselves and people who look like their family represented in the images we display. Similar to books music can provide children with the first interactions with unfamiliar culture. Providing the children with an opportunity to explore different cultures in a fun and interactive way is a valuable experience. Children love to participate in familiar songs and rhymes, especially action songs and this fun and engaging activity can especially support the inclusion of children with English as an additional language. Children welcome experiencing food, music or dance forms that reflect their own family and neighbourhood experiences. Early childhood is a good time to offer opportunities that enable children to stretch beyond the familiar. But again it is important that experiences help children understand that there are different ways to meet basic needs like food and drink. Every culture has some kind of traditional cuisine. Of course, families with English roots should be asked to contribute foods to a multicultural buffet evening, not just families from other countries. Children can learn to appreciate cultural diversity in styles of art, craft, music and dance. All opportunities need to be well grounded in positive pride for the styles common in every child’s own background. Children are attuned to what is familiar and may take a while to become accustomed to less familiar musical patterns. Supportive practitioners establish a ground rule, much as with food, that it is fine to say you are ‘not keen’, but nobody is rude about music or dance that belongs to other people. Children are naturally curious about the people around them. They attempt to formulate a sense of their own identity by defining what makes them different from everyone else. Thus, a child will typically ask questions about observable characteristics like skin color, accent, or manner of dress. “Children are around two or three when they begin to notice physical differences among people” (Kupetz, 2012). For the most part, these questions are innocent and not motivated by any intention to offend or hurt. It is therefore, up to the parents and educators to use these opportunities to send a fair and accurate message about each culture, so that children learn that these differences only makes a person unique, not inferior. An educator or parent can maximize the potential for learning by helping students see each cultural encounter as an enriching experience. “The process of intercultural interaction, of contact between people from different cultural backgrounds and a readiness to learn from one another, is the real foundation for equality” (Balcock 2010, p.33). Some of you may feel compelled to use the “color-blind” approach to instructing your students, overlooking your students’ race or ethnic background in the interests of equality. These are noble intentions, of course, but consider becoming “color aware” instead. Why? Because although students are individuals, they are also products of their environments. No one grows up in a vacuum. A multicultural society is best served by a culturally responsive curriculum (Matthew Lynch). As Early Years practitioners it is vitally important that we engage in issues of diversity in order to create a classroom environment that is both welcoming and supportive of all children within the class. The most structured approach to engaging in diversity topics in the classroom is through the inclusion of diverse perspectives into the content of the curriculum. However, including diverse perspectives into the course content addresses only one aspect of creating inclusive learning environments (Hurtado et al., 2012). In order to create inclusive learning environments that promote learning outcomes for all students, it is best to take a comprehensive approach and address student and faculty identities, curricular content, and pedagogy/teaching methods. Early childhood educators can best help linguistic and culturally diverse children and their families by acknowledging and responding to the importance of the child’s home language and culture. Educational practices should focus on educating children toward the “school culture” while preserving and respecting the diversity of the home language and culture that each child brings to the early learning setting. It is important that we strike the right balance between promoting an understanding of ‘other cultures’ whilst also providing sufficient attention to children’s own cultural identity. A key message for equality practice is that there is no rush. Children become confused if early years practitioners feel pressure to rattle through a long list of ‘multicultural activities’, including many celebrations, before children enter formal school. A few quality experiences can start children on the road to appreciating diverse cultures and traditions. Early childhood professionals and families must work together to achieve high quality care and education for all children. ‘The Global Goals, also known as the Sustainable Development Goals, are a set of universal goals and targets adopted by 193 Un member states. They provide an outline of a vision that helps to create a better future for both the people and the planet. The Global Goals will be used to frame the UN member states’ agendas and policies over the next 15 years until 2030. The Global Goals have been put forward as a ‘transformative’ agenda that incorporates the needs and rights of all people and groups. 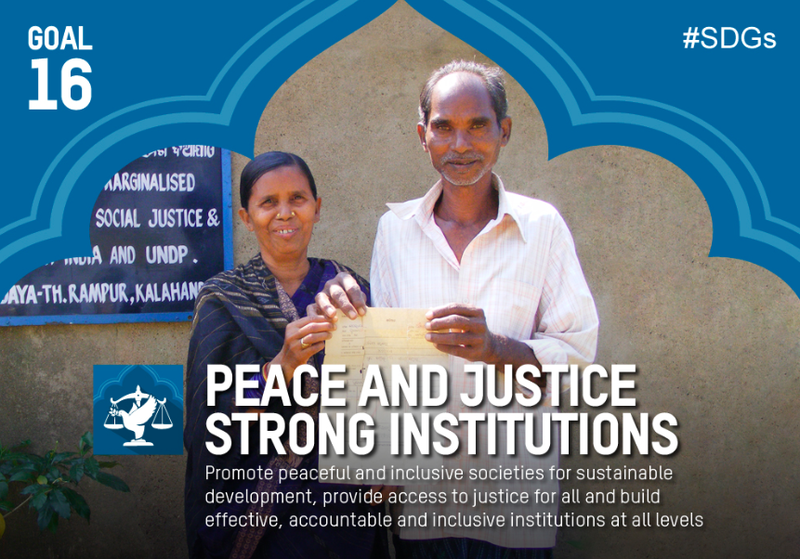 They also include economic, environmental and social aspects of development. The goals are universal and will apply to all countries. Other important issues are included, such as ending violence against children, ending gender-based violence; building peaceful, inclusive societies; decreasing inequality, and much more emphasis on environmental factors that affect global sustainability. 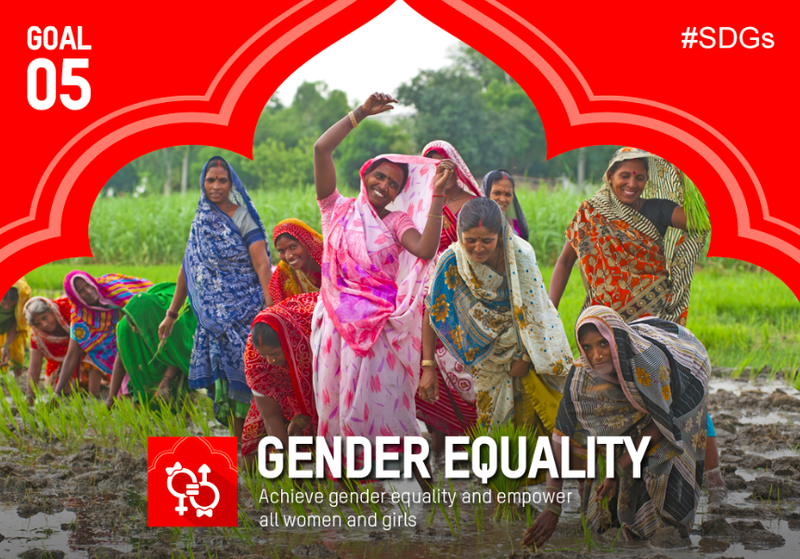 Gender equality, and the importance of the empowerment of girls and women, also play a key role in the goals. 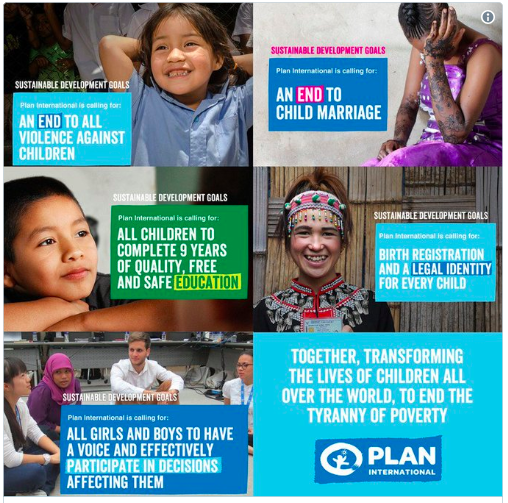 How were the Global Goals Chosen? The UN led an Open Working Group, comprised of Member States’ representatives, which met 13 times throughout 2013 and 2014. Accompanied by a team of technical experts on education, health, climate and other topics, this group discussed the most pressing issues facing people around the world and standing in the way of improving life for all people and the planet. At the same time, discussions were taking place around the world with ordinary people, giving them the opportunity to express their ideas on what should be in the Global Goals. From these discussions, the Open Working Group developed goals and targets that focus on a variety of different themes. For example, some of the topics covered include ending extreme poverty and hunger, and guaranteeing human rights, peace, gender equality, as well as the sustainable management of the environment and natural resources. After the report from the Open Working Group, all of the Member States of the UN got a chance to discuss the proposal. They agreed that what the Open Working Group came up with was a good and ambitious list and decided to adopt 17 Goals. They wrote a “Declaration” to introduce the Goals to the world, as well as some ideas on how the Goals would be put into practice, and how they would be monitored over the next 15 years to see if progress is being achieved. 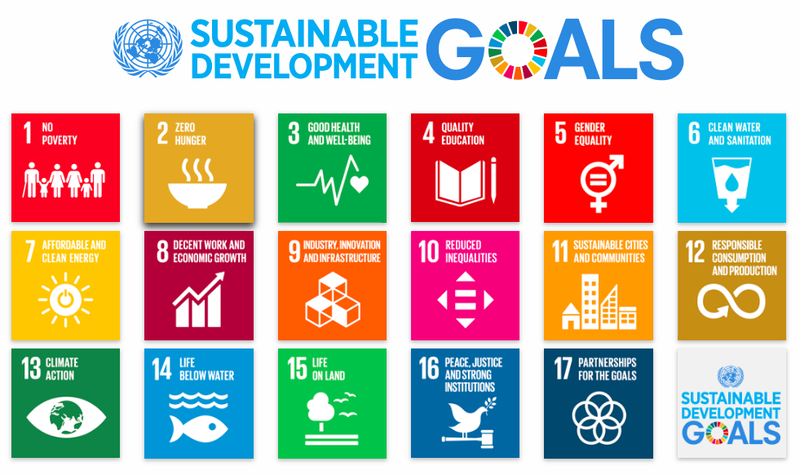 Finally, in August 2015, the Member States agreed on the full agenda for the new Global Goals for Sustainable Development, ready to for a ceremonious commitment to them at the UN headquarters in New York on September 25th 2015. 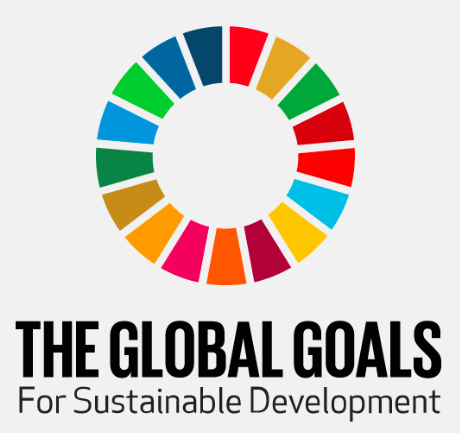 Why Teach the Global Goals? The goals form a useful lens through which to look at the most pressing global issues. Hundreds of millions of people don’t have enough food to eat; women still earn less than men and have fewer rights; plant and animal species are rapidly vanishing; and the gap between rich and poor is indeed getting wider. More than 40 per cent of the global population are between the ages of ten and 24 – the largest youth population ever. To solve the world’s problems, the next generation needs to know what those problems are. A good way to ensure this is to teach them about the SDGs. Studying the goals is part of a broader, international approach to learning. Our research shows that this improves academic skills, helps learners’ mental and moral development and motivates them. It also helps students find jobs when they leave school. For teachers, it’s energising to teach fresh material. It can give their professional development a boost, especially if there’s the opportunity to take online courses or to lead a programme on the SDGs. For schools, there’s a positive influence on their ethos and relationship with the local community. Source: Emily Reynolds, How to teach the UN’s development goals, and why. 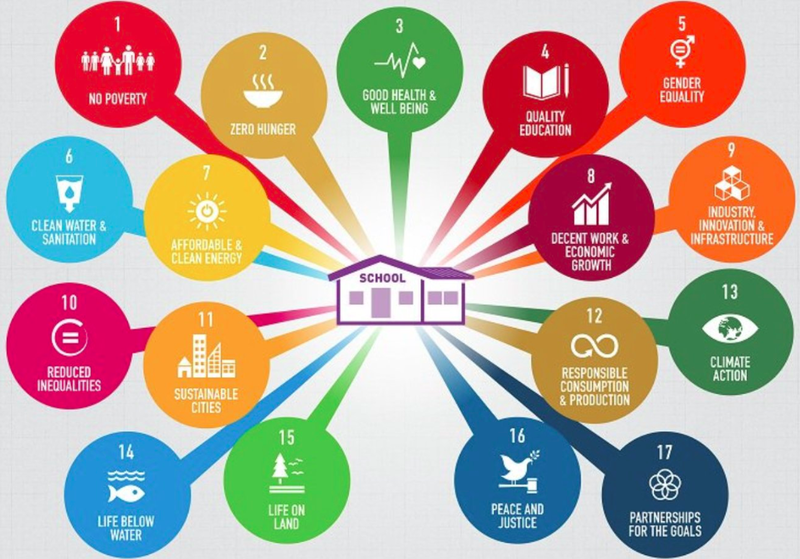 How do we tackle these Global Goals in the Classroom? As I have come to the end of another school year I have been left to reflect on my own achievements with regards to the Global Goals. How much impact has been achieved within my own practice? Has it been possible to make a meaningful contribution to global issues from an Early Years classroom? What impact has my school made towards supporting the Global Goals? What initiatives are happening in my host country of India to tackle these universally important global issues? Throughout the year we have touched on many global issues within the learning and teaching of the classroom and I always remind the children ‘that we can’t expect to change the whole world but we can always make a small difference in our own way.’ I know that I have had some success with regards to the children ‘making their small difference’ but do they have an impact on the Global Goals? Are we able to contribute and make a difference? Within my own teaching practice I have come to think of the Global Goals as essential teaching opportunities. As educators we have a responsibility in addressing these issues and making a positive impact no matter how small. Educating on the issues we all face needs to be started with our youngest learners. It will be these learners that will be most affected by the decisions and actions, or lack of, we take now. These are the next generation that are going to face the reality of the world that we leave behind. It is for these reasons that I believe that teaching the Global Goals has to be placed at the center of our teaching and learning. I consider them to be Essential Goals for life but if we begin to face the challenges together they can become Achievable Goals and a road map to a better future. The Global Goals have become Essential Goals for the peaceful continuation of mankind. Failure to achieve these goals is unthinkable. 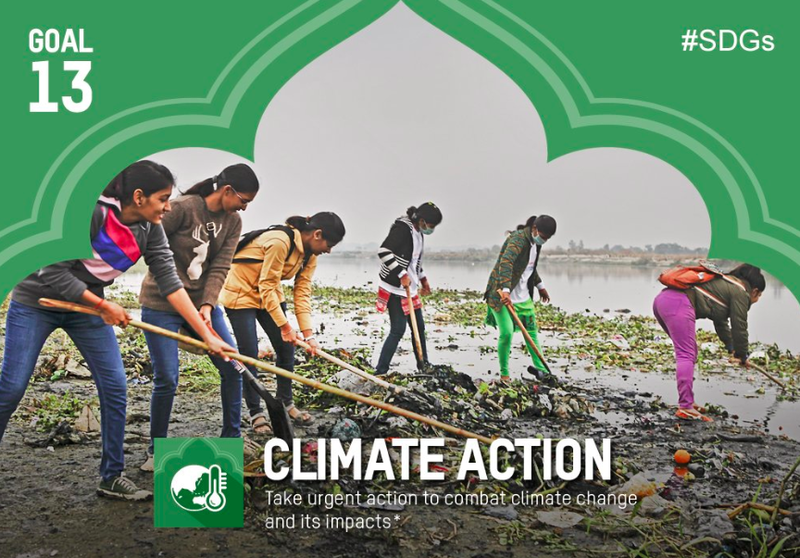 ‘While people of all ages share in the goal of creating a sustainable and healthy planet, it is the youngest members of the global population who may have the most to win or lose in whether we achieve targets for sustainable living. Decisions made by individuals, countries and as an international community will have long lasting impacts that will continue affecting the lives of the members of our youngest generation, who will have more time to spend on the planet in the future than older generations, for many years to come.’ Brian Wibby. Our world is changing quickly and that means we need to change with it. We are at a tipping point in our existence. It is no longer a need but a ‘must’ that we change our behaviour and thinking in how we engage the natural world and each other. The United Nations have given a set of Global Goals that have now become the responsibility of everyone if we are to succeed. 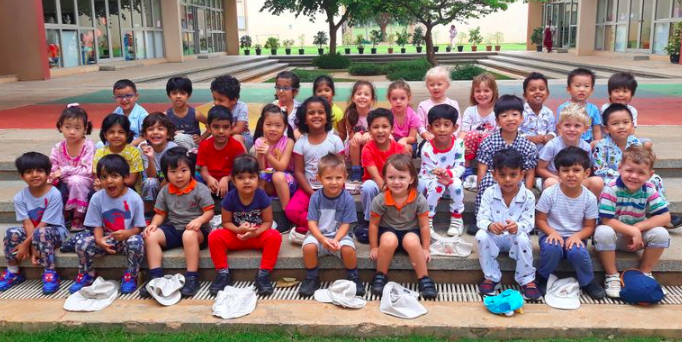 Even our youngest learners have a responsibility for understanding the challenges ahead and having positive interactions with the world around them. As educators we have a responsibility to developing an understanding and awareness of global issues to our students. The tackling of these must begin in the classroom if we have any chance to succeed. 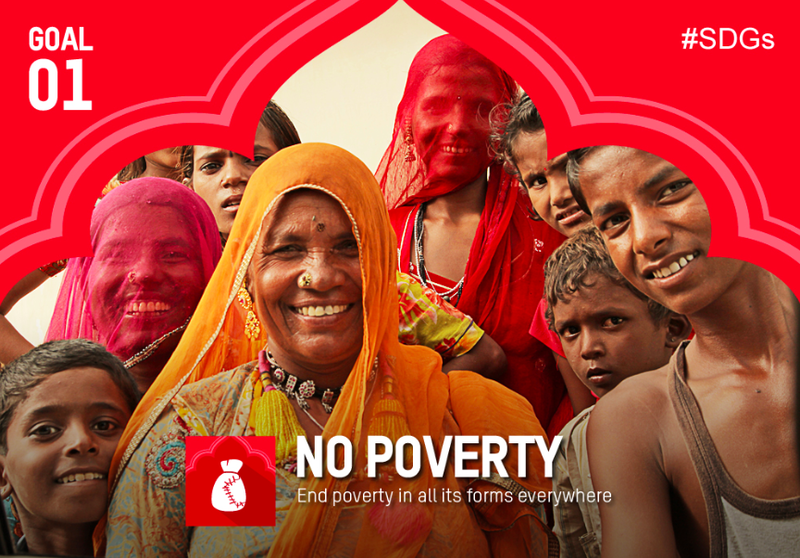 Around the world today, a staggering 800 million people still live in conditions of extreme poverty. With one in five people living on less than USD 1.25 a day, extreme poverty presents one of the most urgent crises of our times. While the number of people living in extreme poverty has declined by more than half since 1990, a great deal more needs to be done. Poverty is more than just the lack of income or access to resources – it manifests itself in diminished opportunities for education, social discrimination and the inability to participate in decision-making processes. For instance, in developing countries, children in the poorest households are four times less likely to be in school than those of the richest. Ending poverty in all its forms everywhere forms the first goal of the 2030 Sustainable Development agenda. It calls for ensuring social protection, enhancing access to basic services, and building resilience against the impacts of natural disasters which can cause severe damage to people’s resources and livelihoods. Between 2012-2013, global reduction in extreme poverty was driven mainly by Asia – notably China and India. Despite the fact that India made tremendous progress in halving its poverty head count ratio by 2011-2012, it still remains at 21% of the population. 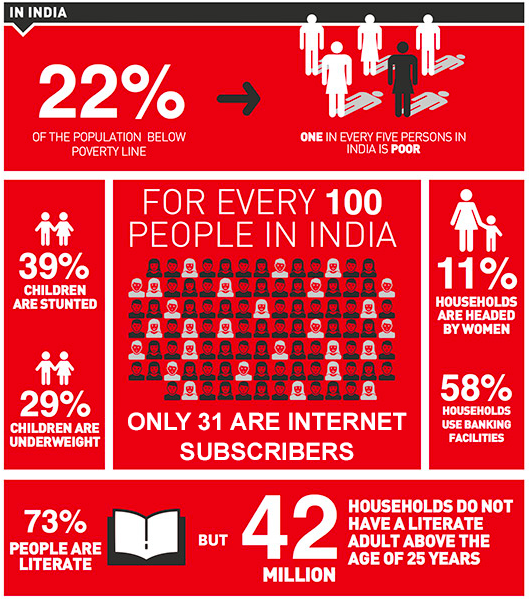 Nearly 80% of these poor live in rural areas and eradicating poverty is at the core of India’s national priorities. 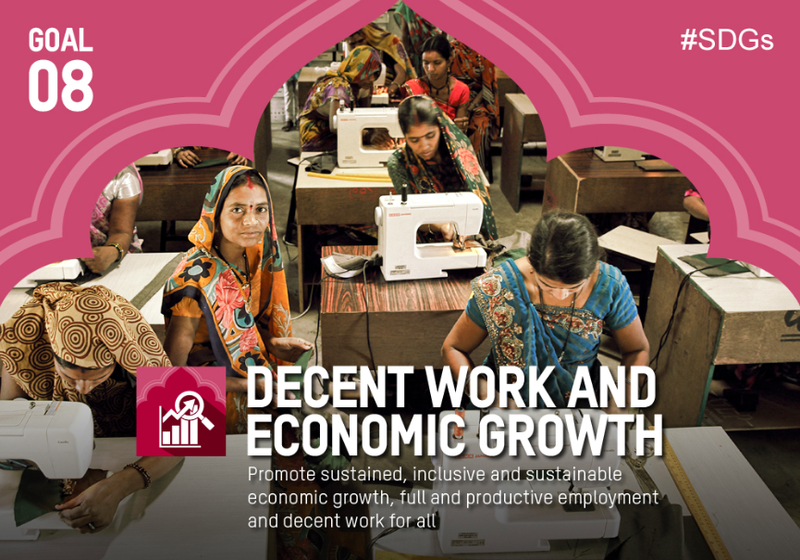 The Government of India has many progressive schemes, including the world’s largest employment guarantee scheme, the Mahatma Gandhi National Rural Employment Guarantee Scheme, and the National Social Assistance Programme. Tackling poverty in all forms is an ambitious goal at any level, especially for our young learners. I was made more aware of the magnitude of the task while supporting an Exhibition Group tackling the issue of poverty. The group had started their journey by viewing poverty in global terms. They quickly discovered that the problems were just too wide stretching, too many causes to be able to make any real impact on our own. The group started to think more localised. They studied the causes of poverty in India and the actions that were being taken to tackle the problems. In the end, unfortunately, the group was unable to take meaningful action but were able to create awareness of the problem. I think for our young learners developing an awareness and knowledge of the issues is probably the most important step in supporting the Global Goals, developing an understanding within themselves of the issues and then creating an awareness in the community. Also developing a greater empathy towards the plight of others and understanding our own privileges. Our success in tackling poverty will also help the development in other Global Goals. High population growth rate is one of major reasons of poverty in India. This further leads to high level of illiteracy, poor health care facilities and lack of access to financial resources. Many of the Exhibition groups in my school this year have brought awareness of many of the Global Goals and through positive, meaningful Action have supported success in a variety of student-led activities. It makes me more positive for the future when I see our young learners leading the charge. Again, another ambitious goal for young learners. However, by teaching these issues it is possible to develop responsibility and understanding within our students. Even our youngest students can begin to make a difference. At the beginning of the year my Early Years class had been given the task of clearing their own plates during lunchtime. This had led to concern over the amount of food being wasted. These simple beginnings had unknowingly started us on a journey of meaningful, sustainable Action over the next coming months. To begin with we started by weighing and recording how much food was being wasted on a daily basis. We recorded our results on a bar chart. We addressed certain behaviours that were responsible for the waste in an effort to decrease the amount e.g. less talking, smaller portions. There was clear enjoyment on the days we were able to reduce our waste. But what happened to our food waste? Being Inquirers we wanted to find out more. Through investigation we discovered that much of our school’s food waste was taken to a nearby farm. On visiting the farm we discovered more about permaculture (The development of agricultural ecosystems intended to be sustainable and self-sufficient). 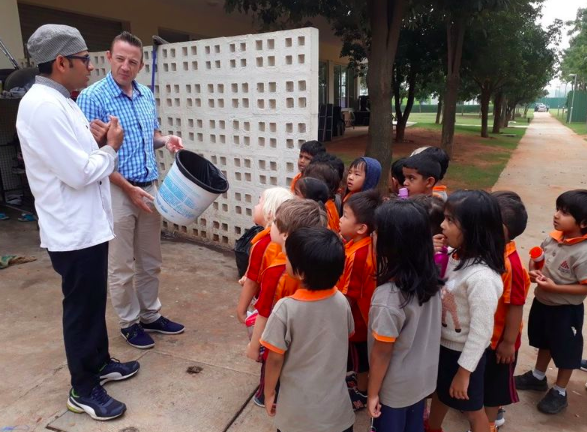 Myriam Shankar who owned the farm is heavily involved in a charitable group, The Anonymous Indian Charitable Trust (TAICT) addressing many of the environmental issues facing Bangalore, India. 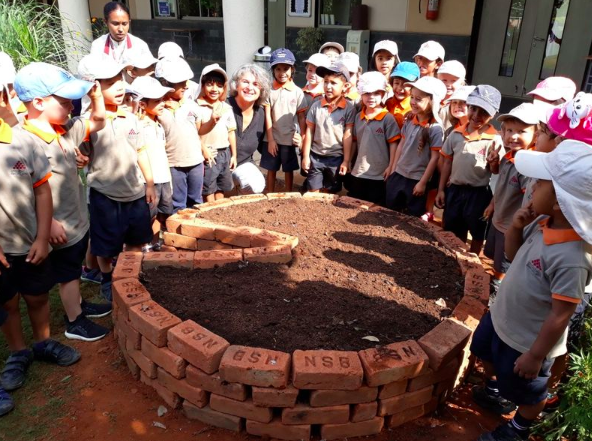 Being inspired by the actions and contributions of members of our local community motivated my class to developing our own permaculture garden in school. With the support of Ms Shankar we were able to turn this into a reality. 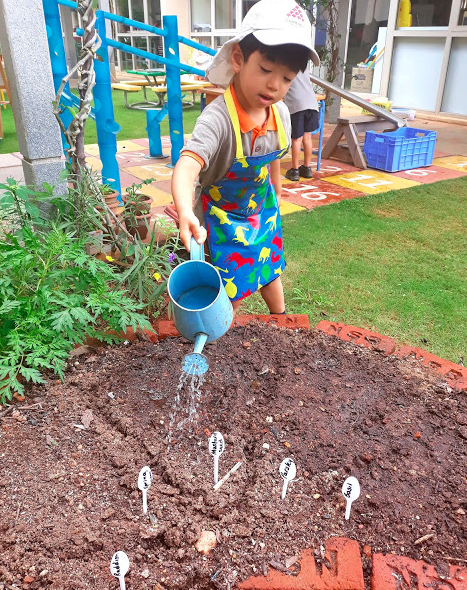 The children loved creating their own garden and planting their first seeds. We are still waiting for our first crops but with what started as an activity addressing responsibility we had unknowingly taken our first steps towards sustainable farming. 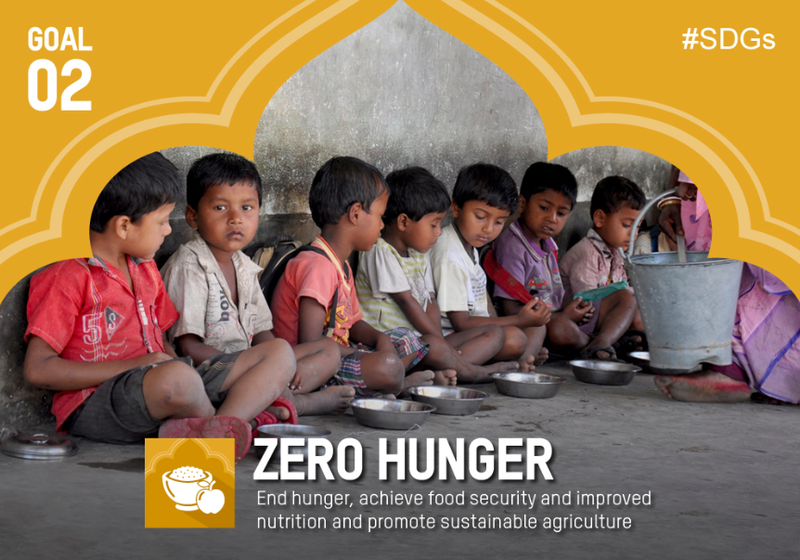 We have not eradicated hunger but throughout the process we had developed a sense of responsibility for our own actions and also an understanding of the steps that can, and are, being taken to tackle the issues. 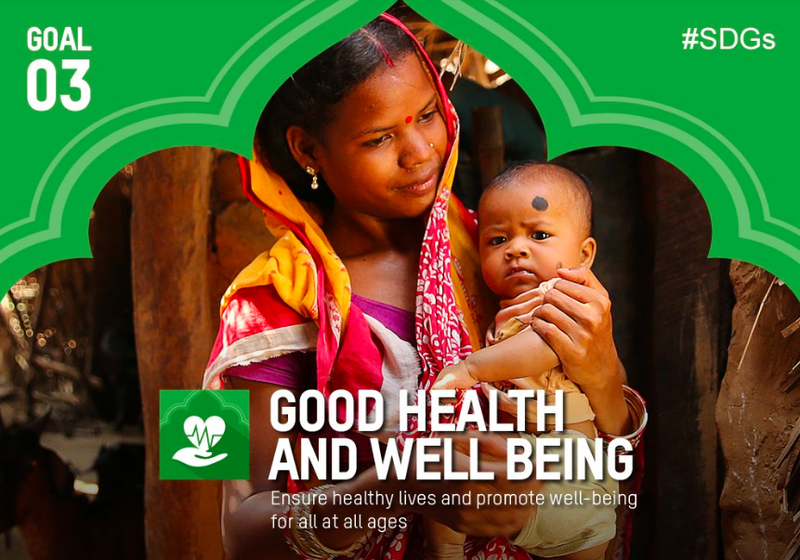 India’s share in the global burden of diseases is quite significant – 20%. It is interesting to note that contrary to this burden, the contribution to the global health-care infrastructure is highly inadequate – India have a meager 9% of the global community health workers, 8% of the doctors globally (from 50,000 in 1947 to 7.7 lacs in 2017), 8% nurses, 6% of the beds for patient care (from 725 Primary Health Centres [PHCs] in 1947 to 28,863 in 2017), and only 1% laboratory technicians – scarce human resource to tackle the mountain of diseases. Health-care access and quality index was 44.8 in 2015, lower than our neighbouring countries (Sri Lanka – 72.8, Bangladesh – 51.7, Bhutan – 52.7, and Nepal – 50.8 and ranks above Pakistan – 43.1 and Afghanistan – 32.5). In addition, Indian public health financing is low, varying from 1.2% to 1% of the GDP, which is among the lowest in the world; neighbouring South Asian countries are faring much better (public health expenditure as a proportion of the total health expenditure was 2.6 times in Thailand, 1.9 times in Sri Lanka, 1.9 times in China, and 1.3 times in Nepal as compared to India in 2014). India’s Under Five Mortality (U5MR) declined from 125 per 1,000 live births in 1990 to 49 per 1,000 live births in 2013. Globally, maternal mortality has fallen by almost 50% since 1990. In Eastern Asia, Northern Africa and Southern Asia, maternal mortality has declined by around two-thirds. But, the maternal mortality ratio – the proportion of mothers that do not survive childbirth compared to those who do – in developing regions is still 14 times higher than in the developed regions. From a Maternal Mortality Rate (MMR) of 437 per 100,000 live births in 1990-91, India came down to 167 in 2009. Delivery in institutional facilities has risen from 26% in 1992-93 to 72% in 2009. By 2014, there were 13.6 million people accessing antiretroviral therapy, an increase from just 800,000 in 2003. New HIV infections in 2013 were estimated at 2.1 million, which was 38% lower than in 2001. At the end of 2013, there were an estimated 35 million people living with HIV. At the end of 2013, 240,000 children were newly infected with HIV. India has made significant strides in reducing the prevalence of HIV and AIDS across different types of high-risk categories. Adult prevalence has come down from 0.45 percent in 2002 to 0.27 in 2011. Working within an IB school we promote the idea of being a Balanced Learner. Balanced learners understand the importance of intellectual, physical, and emotional balance to achieve personal well-being for themselves and others. This concept is promoted and taught throughout the school. Working within an Early Years classroom we have included emotional and physical well-being within our daily routine since the beginning of the year. This is an extremely important aspect of early learning. 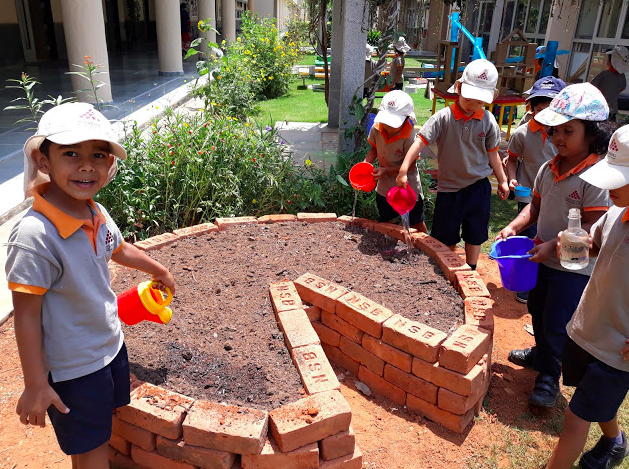 It is at these early stages of learning that the children begin to develop life habitats and it is our responsibility that we promote wellness and physical pursuits with just as much importance as language and numbers. It is widely known that physical education is important for students so that they learn how to sustain a healthy lifestyle later in life. 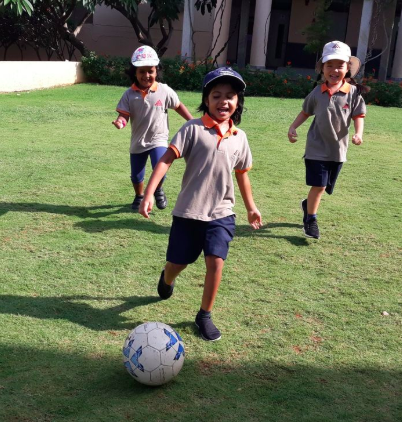 Research has shown that early childhood physical education improves more that just physical wellness, but it also assists and improves mental and emotional developments. As a school we provide a balanced curriculum that supports these developments. This is something that is very close to my own heart as I strive to live a balanced lifestyle which is often difficult to do with the many expectations and pressures of teaching. As much as possible I try to be a role-model to our young learners promoting a balanced life of work and play, both equally important to create a healthy world. 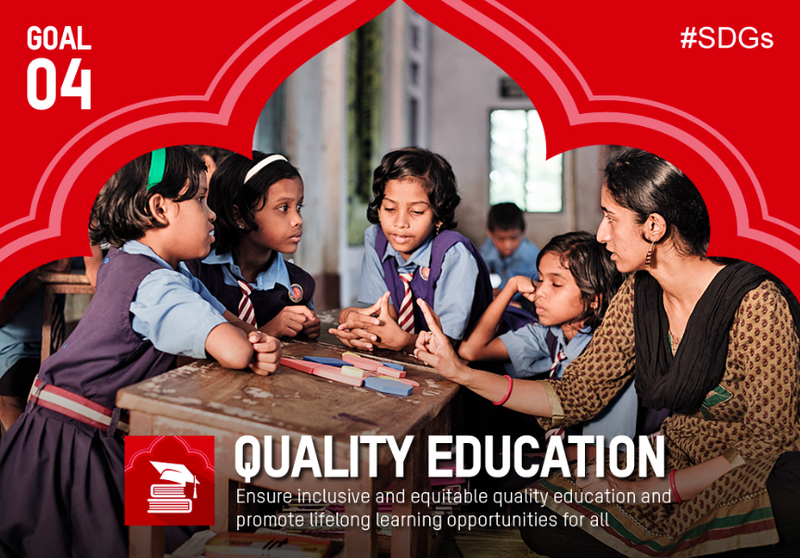 Education reduces poverty, boosts economic growth and increases income. It increases a person’s chances of having a healthy life, reduces maternal deaths, and combats diseases such as HIV and AIDS. Education can promote gender equality, reduce child marriage, and promote peace. In sum, education is one of the most important investments a country can make in its people and its future. It is somewhat pleasing to see the contribution that my school has made to the development in education in the local area. The ownership sponsors our neighbour government school providing a range of facilities. Many student initiatives coming through our Exhibition groups work on providing funds and support to the local school. This year, for example, one group raised money to provide the school with a years worth of internet access. The PTA has raised money to provide sports and technological equipment. Although well intended I often wonder if it goes far enough? Is this just a form of tokenism or is this a real attempt to create equality in education? 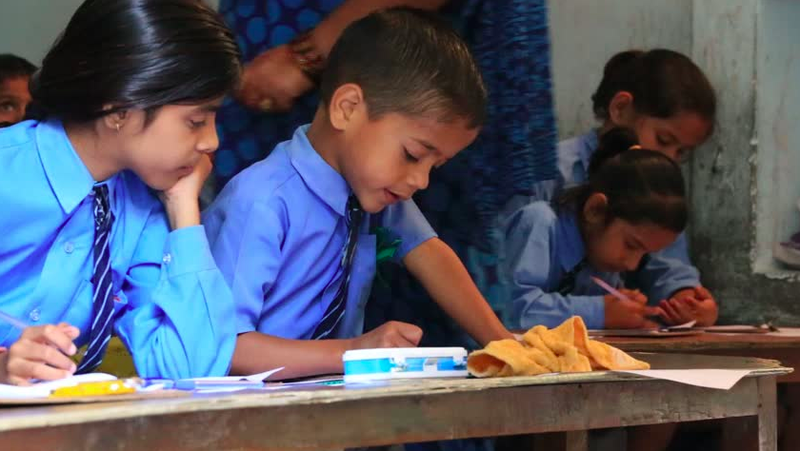 ‘If we believe an education is a prerequisite to accessing opportunities that lead to better life outcomes, we must critically examine the intended and unintended lessons of education programs for the poor. Teaching skills, while important, does not sufficiently narrow the equity gap between the poor and the privileged if the process of learning is reduced to the rote following of procedures. Be bold in our aspirations. Our aspirations for poor children fall short of what we would want for our own. Think of the young children you know: expressing ideas and opinions, asking questions, being imaginative, and having a voice that matters are integral to the development of a young human being. While the children we serve often live in dire circumstances, they have the same education needs as our own children. Value the quality of classroom interactions. A quality education needs to value both outcomes and process, and indicators of success should reflect this. In addition to finding out how many words a child can read correctly in a minute, we need to ask ourselves questions like: Are children invited to share ideas and express opinions? Are there opportunities for creative expression? Are children learning skills that could empower them to challenge class barriers? 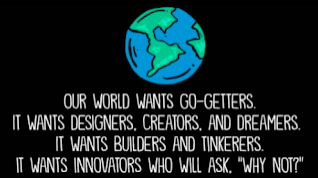 Within my own classroom I believe I am supporting this goal by helping to create a generation of students becoming lifelong learners. It is my goal that the children continue to succeed both in and out of the classroom. The idea is to make sure that once they leave the classroom they no longer need us. My students become the teachers and the leaders and they never stop being learners. This will be an important development when my students become the next world leaders. As educators we are responsible in helping develop a mindset of learning in our classrooms. We must encourage the children to take responsibility and independence for their learning. Create a classroom culture in which mistakes are treated as learning opportunities. We must help support the students in recognising tools for learning. What are they passionate about and how can they research and share their knowledge and ideas. Give them opportunities to teach this knowledge to other people. These students can impart valuable lessons of learning ownership and knowledge sharing to others. These students can be an inspiration to others. Provide time to play at any age. Through play our students learn communication, comprehension, and unique social skills. Play is an important part of learning. It’s essential that learning is fun and enjoyable. Otherwise, the learner will resist it. We must ensure our kids never see learning as a chore but as an adventure. Set clear goals for our students so that they realise that learning should have a purpose. To have any value, it must be a meaningful and useful experience. This is especially true for our youngest learners. Goal setting is one of those lifelong learning skills that strengthens the desire to learn. It will be by helping to support a new generation of lifelong learners that we will be able to create sustainable change on our planet. Early childhood is the most important phase of development of a person’s life. This is when cognitive, social and emotional skills are learned, influencing lifelong educational achievement, health and wellbeing. When young girls and boys are denied access to the opportunities, care and services they need to thrive and develop to their full potential, this affects the rest of their lives. 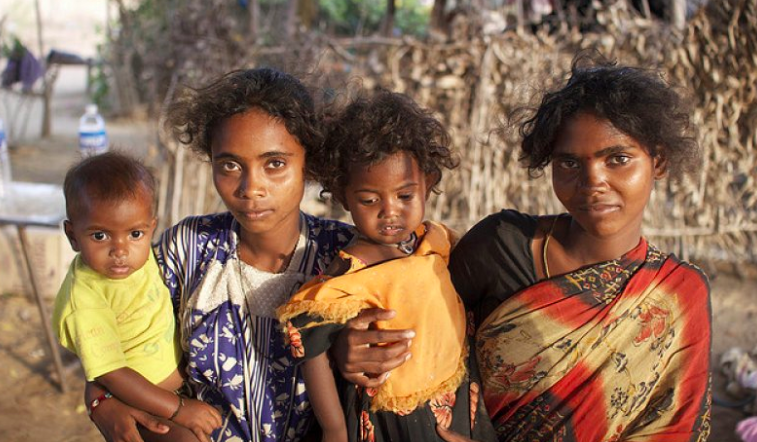 In India around 60% of women are still illiterate. Illiteracy is the root cause of socio-economic problems. Due to the lack of education women are not aware of business, technology and market knowledge. Lack of education also causes low achievement motivation among women. 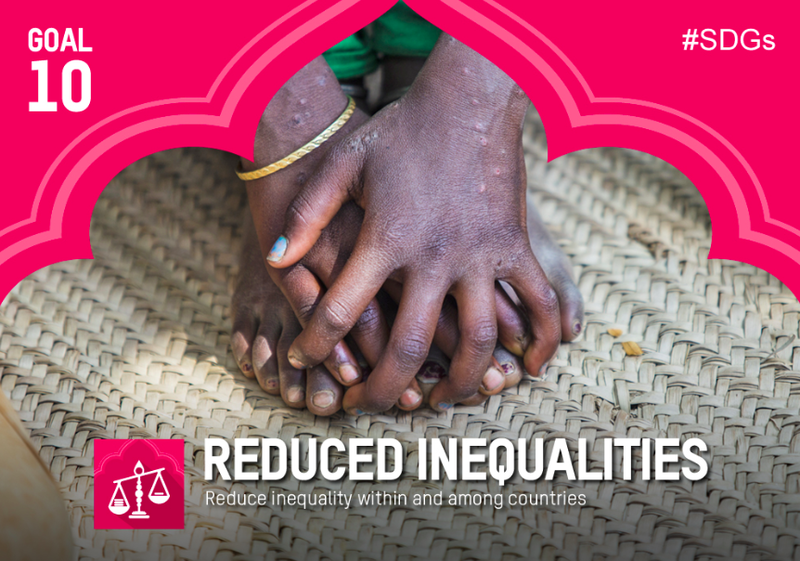 In many communities, gender inequality is one important root cause of children’s poor development in the early years. Gender discrimination and women’s low status are at the root of women’s limited autonomy and of the denial of their rights to health and bodily integrity: when women suffer poor mental and physical health and limited decision-making power this, in turn, impacts negatively on their children’s survival, healthy growth and development. Gender discrimination together with son preference mean that young girls receive less nutrition, opportunities to play and access early learning than young boys. Furthermore, it is during their first years that girls and boys learn gendered attitudes and expectations – from parents, caregivers, other family members and teachers – about how girls and boys/women and men should behave, their social worth and what their role is in society. As our research shows, in many countries and communities, right from the earliest age boys are prepared for their future role as provider and protector, and girls as mothers and caregivers. Learning these rules and expectations in terms of behaviours and roles can be limiting for all children – but is likely to be particularly limiting for girls. ‘Ensuring school curricula, teaching materials, and teachers reflect principles of gender equality helps to empower girls and to make them equal to boys. Additionally, when teachers explicitly teach issues of gender equality, girls gain tremendously. ‘There is an increasing body of evidence to support the enormous benefits of having women entrepreneurs within the business world. From the Center for International Enterprise to the Harvard Business Review, business experts have agreed for several years that the world needs to support the development of women entrepreneurs. Studies are showing that when women gain access to their own financial freedom, they are lifted out of poverty, children begin to become healthier, and the overall economic status of a country improves. Creating more equal educational opportunities for students begins in the classroom and with the teacher. A strong teacher is one who treats their students fairly and creates an environment where students feel equally able to take part. Within my Early Years classroom I try to challenge gender stereotypes as much as possible. I have found that gender stereotyping starts at a young age and it is here that it is the most important to challenge it. This may include the toys they play with or colour they identify with being male or female. I emphasis to the children that boys and girls can choose to play with any type of toy. 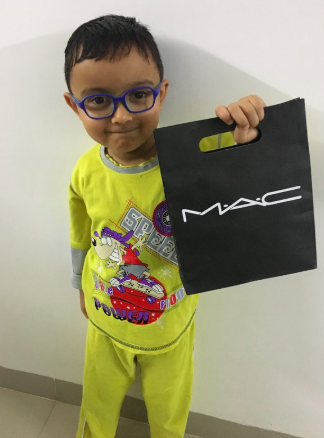 Pink is not just for girls but boys can like pink to. Since the beginning of the year many of the children have brought me flowers. As a habit I began to place the flower behind my ear. This soon became the norm for the rest of the year. Each morning one child would arrive to give me my flower for the day. At first some of the children, and other teachers to, thought it strange that a boy should have a flower in his ear. I would reply ‘Boys can be pretty to.’ By the end of the year it was not uncommon to see other boys in the class wearing flowers in their ear. This is the change that I can make to mindset. I challenge the norms and provide a positive rolemodel to the children breaking down the barriers of gender. Hopefully this will be the mindset that the children will take with them through life. India is facing its worst water shortage in history. Six hundred million people are dealing with high to extreme water shortage, according to a report by Niti Aayog, a policy think tank for the Indian government. The report states that an average of 200,000 Indian lives are lost every year due to inadequate supply or contamination of water. 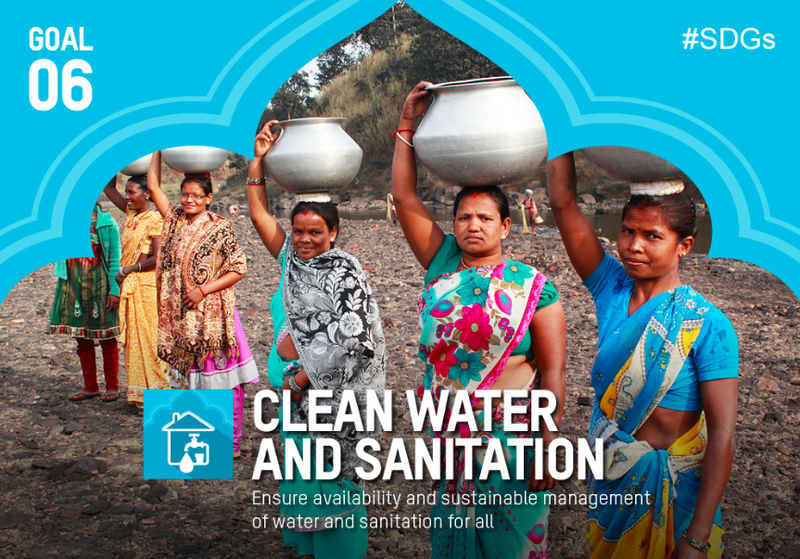 Sustainable water development has seen slow progress in India in recent years. Though 80% of the country’s states have water conservation legislation, bad data management and nonexistent pricing of water have kept the country from making significant change, the report states. Poor irrigation techniques and severe contamination of groundwater have brought India to the edge of this crisis. I have found sustainable management of water to be an especially difficult issue in an Early Years setting. 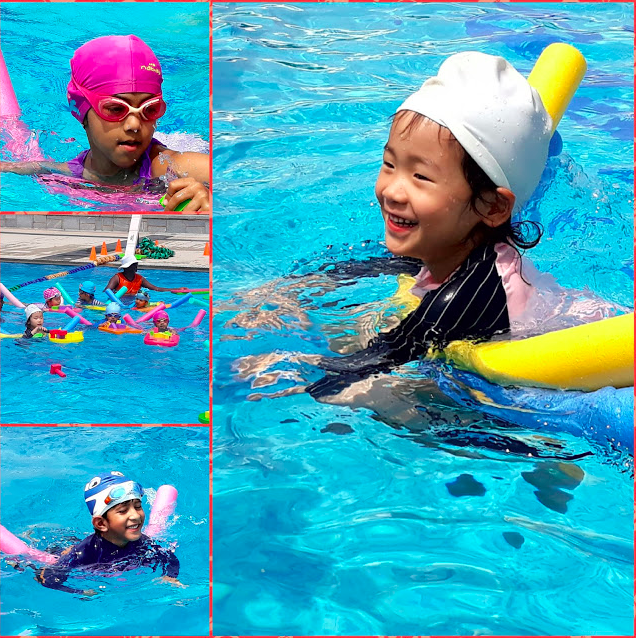 Water play is such an important activity to the development of the children and is available in my own class on a daily basis. I had become concerned about the amount of water that was being used and was there more we could do. Especially when Bangalore is in real danger of running out of water. This was a very real localised issue. We discussed this as a class and what we could do to become more responsible for our water usage. I was very pleased with the children’s responses as they were very selfless. They debated if ‘we should be using water at all’. There seemed to be more concern for the environment and our impact on it than for their own enjoyment. If we are to tackle the global issues successfully this is the kind of mindset change we require. After some discussion it was decided that we would use less water by being more careful where we splash it. We would not refill the water until it had all gone. My favourite suggestion was that if there was any water left at the end of the day we could use it on the plants. 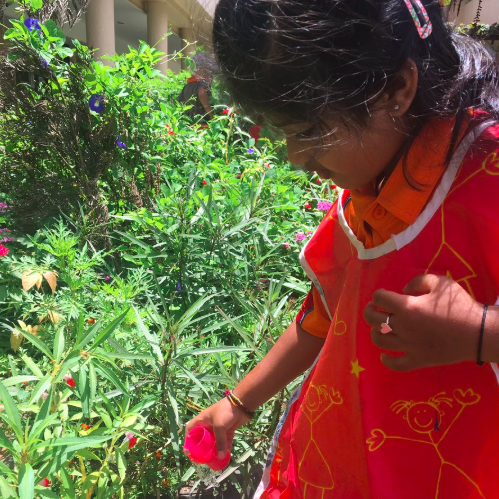 Since our discussion the children have taken great pride in using the leftover water to give to the plants. A cycle of work and play that is helping to support our environment. Again, the mindset we will need in order to succeed. Energy is critical and people with no sustainable access to energy are deprived of the opportunity to become part of national and global progress. And yet, one billion people around the world live without access to energy. Almost three billion people, 41% of the world’s population, do not have access to clean fuels and technologies for cooking. 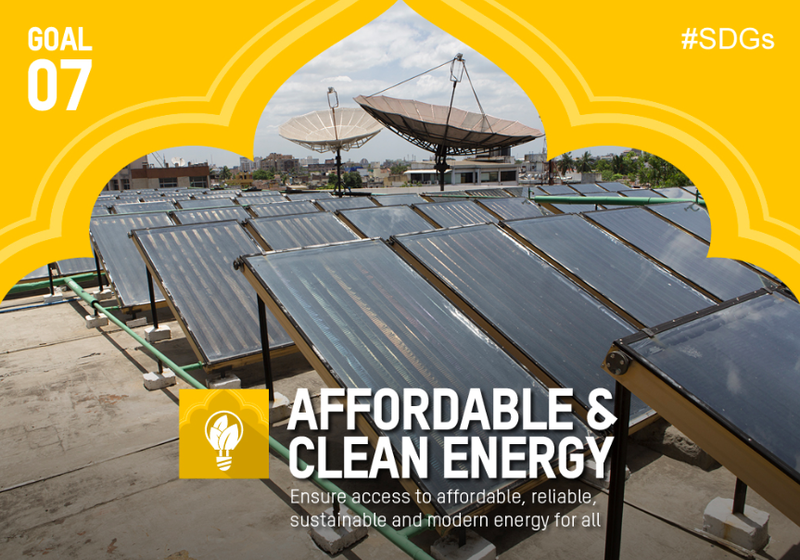 To expand energy access, it is crucial to enhance energy efficiency and to invest in renewable energy. Asia has been the driver of progress in this area, expanding access at the twice the rate of demographic growth. 72% of the increase in energy consumption from modern renewable sources between 2010 and 2012 came from developing regions, including parts of Asia. I am unsure how much I have personally contributed to this goal. 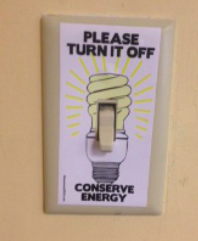 In a small way we have developed a greater sense of responsibility for our energy use within the classroom. We turn the lights off and other electrical equipment when we leave the classroom. I like to support a flexible learning culture which allows the children move freely inside and outside the classroom. We have discussed the reason that we do not use the AC is because we would waste energy. I suppose in our small way we have made a difference and the children are developing an awareness of their energy use. Within my Early Years classroom I help to provide the children with opportunities to explore a variety of different roles within our community. 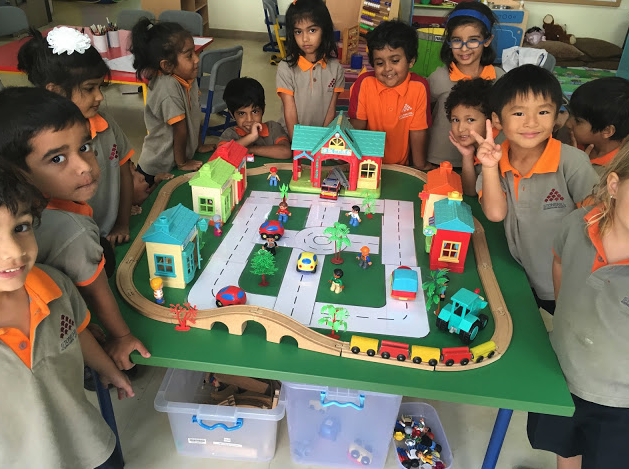 Role-play is always a favourite way to introduce the children to a variety of community helpers. It helps to develop an understanding of the important role that each plays in supporting our community. In our inquiries we take the time to explore the role of everyone and not just the teachers and administration. Everyone is recognised equally in their contributions. I am fortunate to work in a school were we do show appreciation to the valuable support staff that make the smooth running of our school possible. 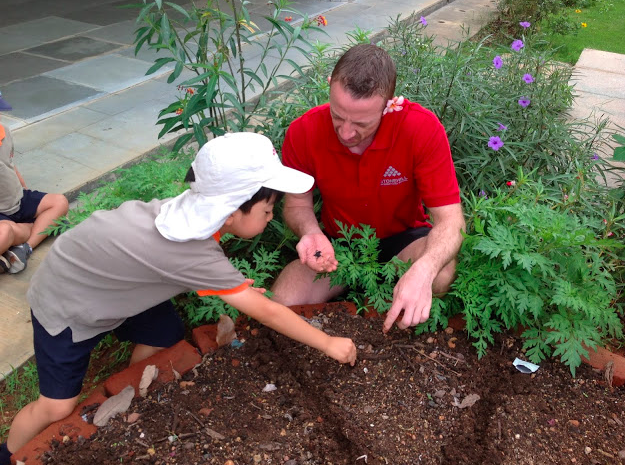 Many of the teachers take time to make personal connections to the maids, security, drivers and gardeners around our school. As a school community we are indebted to our support staff, who contribute in so many ways to make our school a wonderful place to be. We don’t always see them, so much of their work is done behind the scenes, but it would immediately evident if they were not there. Each year the school recognizes the support of these individuals within school events. Many of the children come from privileged backgrounds with nannies, drivers and maids so I believe that it is important for the children to develop a respect and understanding for the roles these people play. In some instances adopting the role of parent in the absence of their own. The children must develop a sense of their own privilege and recognise the importance these people play in their lives. Developing a sense of respect for all is a key motivation in this exercise as well a greater understanding of how communities are formed and connected by people’s support and involvement. It is always pleasing to see the children demonstrated greater appreciation for many of the school’s support staff by giving a simple ‘hello’ or using greater manners when speaking with them. Developing a sense of empathy for the roles people play in Early Years helps to create a generation of adults that show more understanding, better and fair treatment in the future workplace. I have been unsure of how to address this global issue from the classroom to make a direct impact. I suppose in my own way creating a classroom environment that supports collaboration and innovation is a step in the right direction. 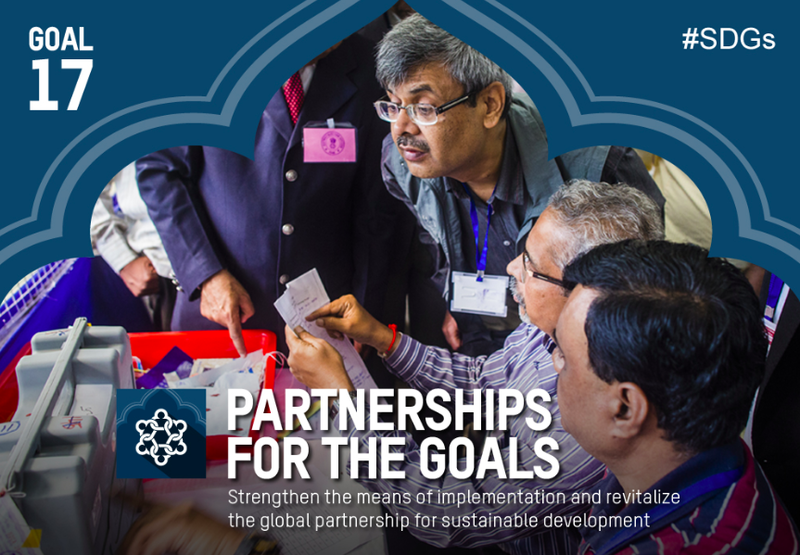 For success in tackling the Global Goals we require a collaborative effort. We need to support a generation of innovators that are able to address the global issues with fresh eyes and ideas. A person that is unable to innovate cannot achieve ambitious goals. As research shows it is the development of habit, thinking and behaviour in the early stages in education that lay the foundation for future life. Indian industry has not only been resource intensive but has also been polluting and generating billions of tonnes of solid and hazardous wastes with no proper management system. Most of these industries consume a large quantity of water and as a result the wastewater discharge is also very high. To quote some of the statistics, most major industrial sectors in India consume 25% to 100% more energy than the global best practices. And for every cubic metre of water consumed, the value addition in India is just 7.5 US$. This figure is much lower in comparison to Korea, UK, Sweden and other industrialized countries. Such a model of industrialization is not sustainable. 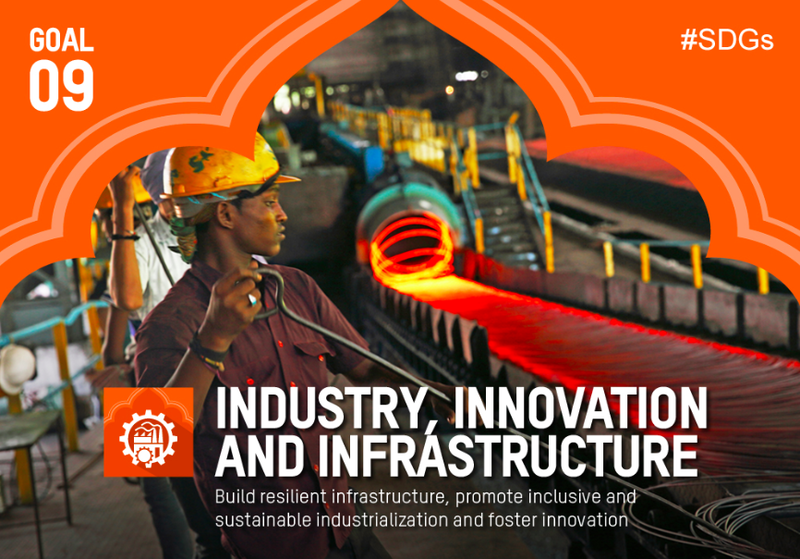 The sustainable industrialisation which India needs to focus on is alternate system in every field. In healthcare, for example, Ayurveda, naturopathy and yoga, renewable sources of energy such as, solar, wind, hydro, biomass. Similarly, public transportation systems, light weighting of vehicles and development of electric vehicles rather than vehicles running on fossil fuels. Organic farming, drip less irrigation are also some examples of sustainable innovation models. The UN Global Goals are universal yet the problems and issues faced by individual nations and countries is not. In many countries it will be the breaking of cultural traditions which will be the most difficult. There will be a need for a change in mindset. 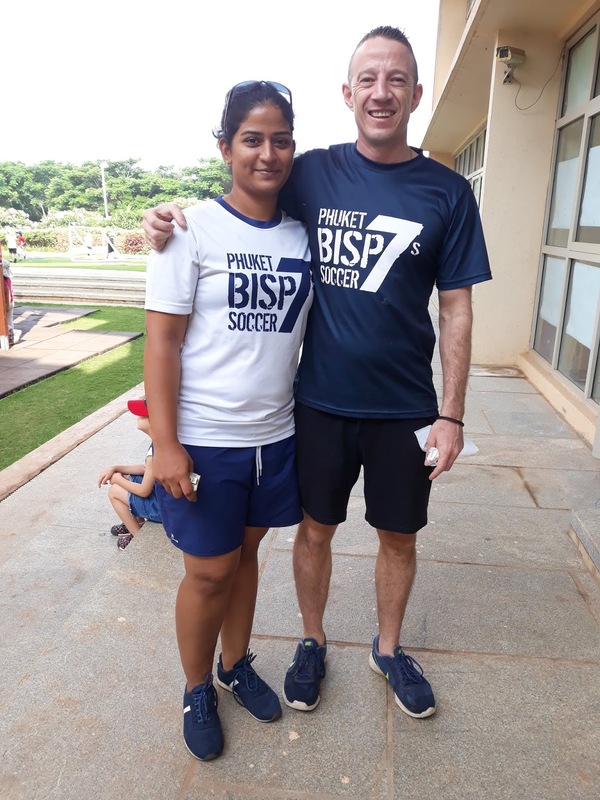 The goal of equality, for instance, could be especially challenging in my host country of India were the inequality amongst the population can be ingrained in the very culture and traditions of the country. It will be the challenges to culture and mindset that will be the most difficult in achieving success in the Global Goals. 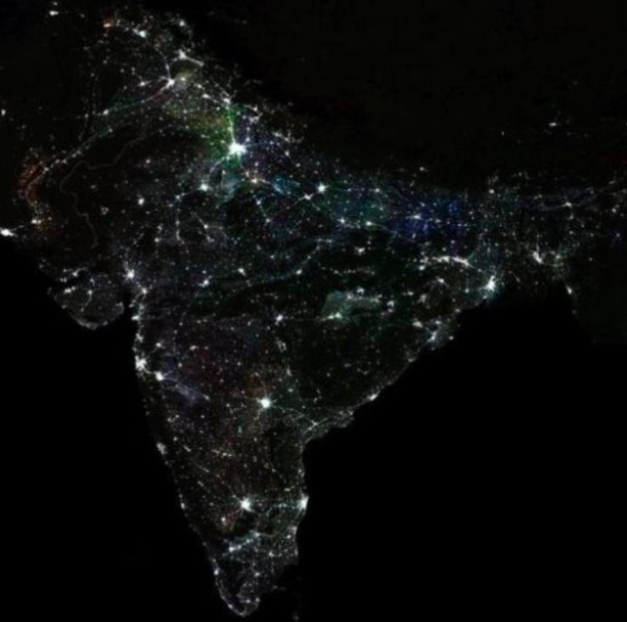 The map on the right only visualises the inequality across India with regards to its energy use. ‘Ancient Indian society was divided into four varnas, or categories: Brahmins (priests), Kshatriyas (warriors), Vaishyas (merchants or traders) and Shudras (laborers). An unofficial fifth varna were the Dalits, or untouchables, a group so low that its members are assigned jobs like cleaning latrines, sweeping the streets, tanning hides and handling the remains of the dead. India’s last caste census was conducted in the early 1930s, when the country was still part of the British Empire. It found that while Brahmins constituted only some 6 percent of the population, the other lower castes, even without Dalits and the tribal people, who are not part of the caste system, came to as much as 40 percent. It would be unthinkable in many instances for these divided groups, based on ancient tradition, to share a glass of water or even sit at the same table. It is a tradition and culture built on inequality and this will be the challenge that will need to be overcome in achieving our goal. 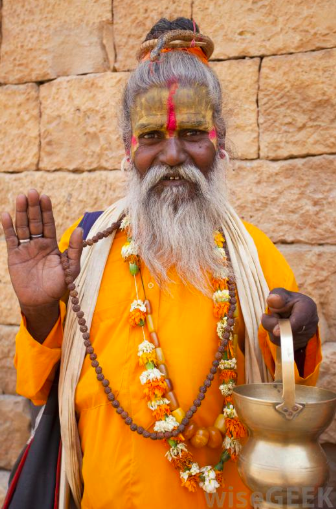 As a guest in India I feel a little insecure speaking to loudly against traditional and cultural practices. With many of the Global Goals international support is welcomed, encouraged and can make a difference. With regards to this specific goal I believe that the change needs to come from within India itself. The rest of the world can model equality with the hope that it can change mindset and tradition. In my own way I can express opposition by non-compliance in my own behaviour and attitude. As a role-model to the children I need to show fair and equal treatment for all regardless of social status within the community. I pride myself on building relationships with the local community through mutual friendship and respect. My hope is that the children I teach model this behaviour. My school also does its best to help support the local community and try to bridge the divide. The ownership of the school has adopted the government school in the neighbouring village. The Parent Teacher Association in the last 2 years has contributed sport equipment, books for their library and also helped certain aspects to build computer lab in the government school. The students also do many service learning projects with this school. Many of this years Exhibition groups worked hard to raise money to support the school in a variety of ways. One of which was to raise money to provide internet access for the next school year. I always feel that international schools can and should do more to support our local communities. In my experience the international schools do provide jobs for the local community in the form of support work e.g. cleaners, drivers, security. Although this practice does supply much needed employment it also indirectly supports the idea of inequality. As well as employment could not our privileged schools provide more scholarships to the local children. Have representatives from the local community active in the leadership of the schools, being decision makers. Provide teacher training for local teachers so that local community members can be represented amongst the teaching staff rather that just within the support staff. I feel that we need to take more action. If we really mean equal then provide equal opportunities. The local community don’t need hand outs or second class employment opportunities, they desire equality in all aspects. Bangalore, my city of residence, is one such city that has grown rapidly over the last decades. It is amazing to hear stories of older Bangalore residents that talk of green quiet spaces with an abundance of wild life. The days when Bangalore use to be referred to as the ‘Green City’ seem to be long gone. Unfortunately we have been left with an overcrowded, polluted city where the development of infrastructure has failed to keep up with demand. 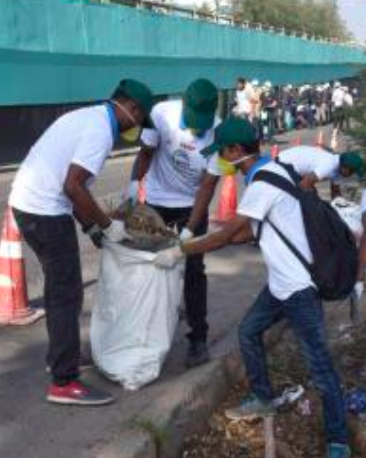 Thankfully there are a growing number of organisations that have developed initiatives to try and clean up the city. Through the work of volunteers and organisations work has begun to clean up the city, but will it be enough? 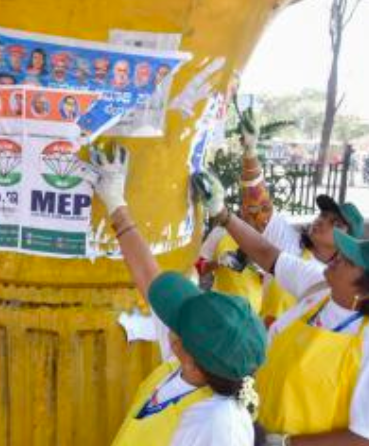 It is a huge task that will need to support of the population and the governing parties if they are going to succeed. 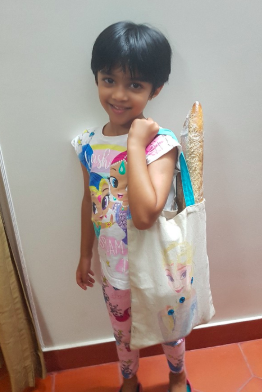 Myriam Shankar from our school community has been invloved in a campaign to clean the streets of Bangalore. She suggests that the effort will also take a change in mindset in the local residence if there is to be any progress. “Civic agencies mustn’t be blamed for all the mess. In my own locality though door-to-door garbage collection happens, lots of plastic and paper are found littered all over the drain and roads. People think they must clean their house and throw the garbage out. As long as they don’t start worrying about the hygiene factor outside their homes, nothing much can be done,” she says. Sustainable solid waste management is essential. This implies waste reduction, reuse, recycling and composting, incineration, and disposal in landfills. Waste reduction, recycling, reuse and composting are preferred methods and should be promoted, as they reduce demand on scarce environmental resources, decrease energy use, and minimize the quantity of waste that must eventually be incinerated or disposed in landfills. Within my class we have inquired into the organisation of communities. Learning about the basic infrastructure needed with special importance on the creation of green areas. With my young learners I have connected the organisation of communities to the feelings of the people who live there. This is an attempt to bring the issue to a level that they would understand e.g. If there were no parks or ponds would you be happy? Would a lot of noise and pollution make the people who live there happy or sad? Why? Even at this basic level I can provide the children with a simple knowledge and understanding of how a ‘happy’ community can be oragnised. It is this basic introduction and understanding within the Early Years that will create a mindset for change in the future. Again we are attempting to change the little things we can in order to make as much difference as possible. 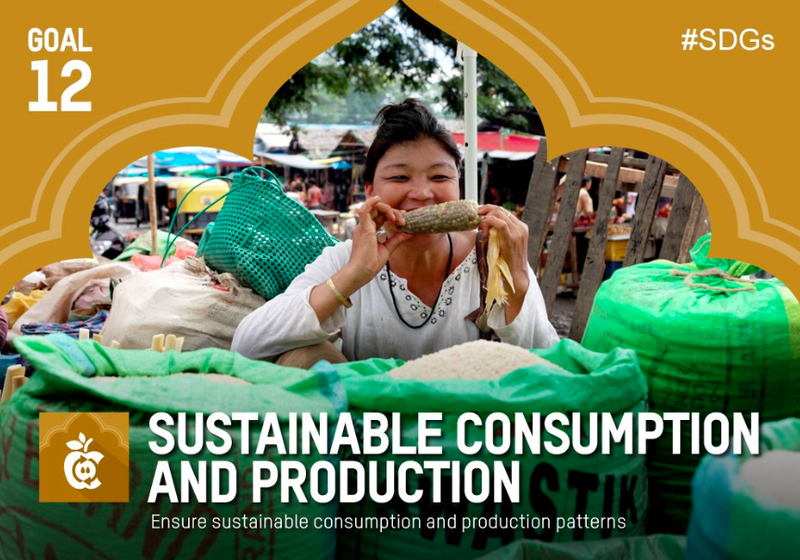 ‘Achieving economic growth and sustainable development requires that we urgently reduce our ecological footprint by changing the way we produce and consume goods and resources. Agriculture is the biggest user of water worldwide, and irrigation now claims close to 70 percent of all freshwater appropriated for human use. India has vowed to ban single-use plastic by 2022 to combat the damage throwaway plastic cups and plates do to the environment. It’s a huge move for the fastest growing economy in the world with a population of 1.3 billion people. India already has many projects to promote green energy and tackle pollution. It’s building roads from plastic waste and has rolled out trains that run on solar power. 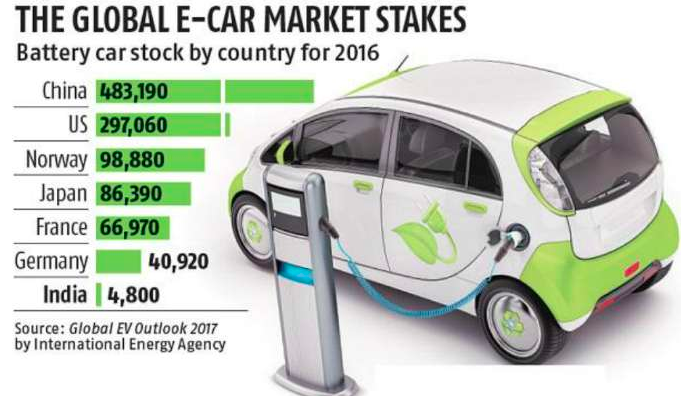 India even plans to make all cars run on electric by 2030 but the country’s pollution problem is already severe and there are questions over whether existing bans on plastic bags in individual states are effective as some are enforced more strictly than others. From our Early Years class we are in a difficult position to make a change to the production of goods but we can make a difference in creating a change of mindset in the consumers. Through my own experience I have found that it is important to teach about global issues early. Many of our young learners engage enthusiastically in the learning demonstrating a deep empathy towards the destruction of natural world. It is something that they are naturally interested in. 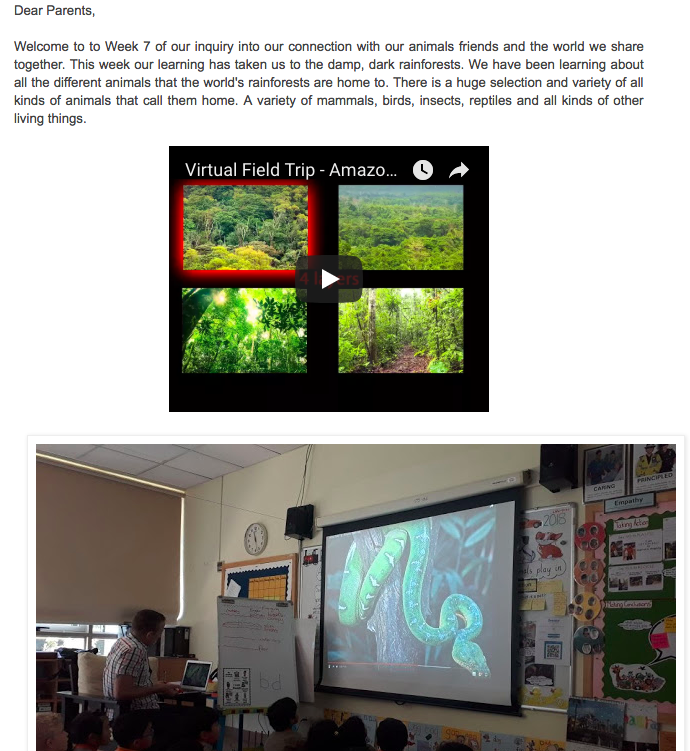 During the course of my final inquiry we had been learning about animals. 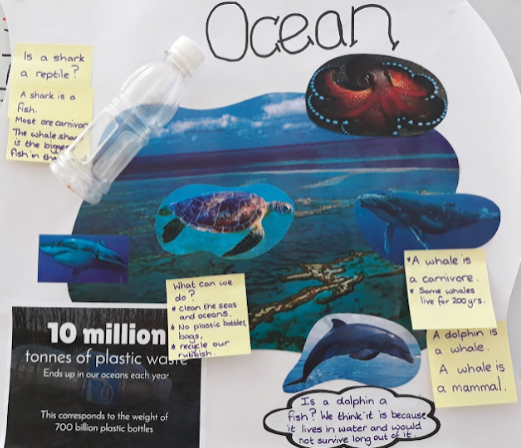 Soon we were learning about the harmful destruction of many of the world’s natural habitats in in particular how our use of plastic was polluting our oceans. We did go a period in our learning when my children thought that plastic was almost ‘evil’ but with some discussion they realised that it was not the material that was wrong it was what we did with it when it was no longer useful. The personal connections that many of the children made to the learning was amazing. 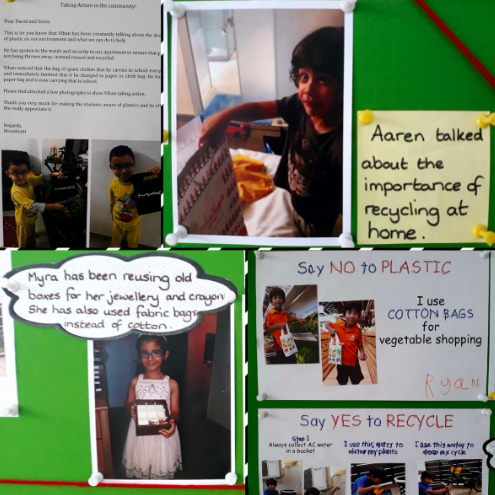 Almost everyday I had emails from parents highlighting action the children had been taking at home: Recycling food, reducing our use in plastic bags, reusing a variety of materials for different purposes. The response was overwhelming. Even just talking about the subject and creating greater awareness in the home is a huge start for our little learners. It is possible, and we should, introduce global issues in a way that the youngest children can understand and begin to make a difference. It is something that they are naturally curious and enthusiastic about being part of. I believe that it would be wrong of us to underestimate the impact that we can make. In Early Years the children may lack the capabilities to make huge changes but we can make a change in mindset. 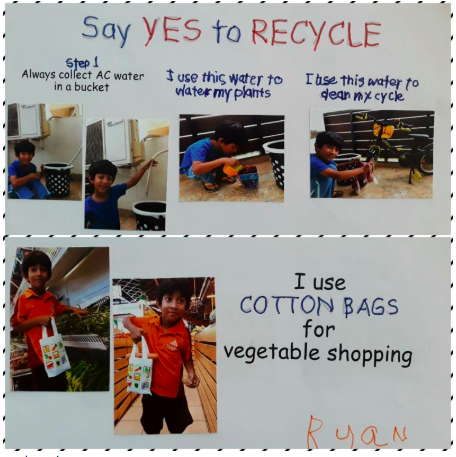 My children had clearly demonstrated a mindset shift in becoming responsible consumers with a developing understanding of correct waste material management. If we can bring this change to the next generation the future may be bright. India’s population and emissions are rising fast, and its ability to tackle poverty without massive fossil fuel could decide the fate of the planet. 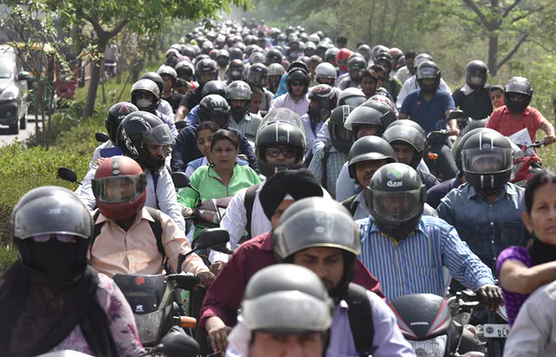 India’s vast population means that even small increases in emissions per person add up to a huge amount of carbon dioxide and India is likely to become the world’s biggest polluter. The Indian government is working hard to find greener forms of energy. The commitment, investment and initiatives vary from state to state making a universal policy difficult to implement. 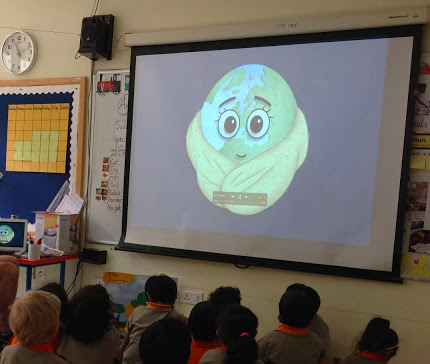 Within the Early Years classroom it is possible for the children to access the topic of climate change in terms that they understand. It is about opening up discussions about the world and making them realise that the world is changing both naturally and more importantly through the activities of humans. A changing world can be a challenging concept for some children to understand. For them the world remains constant and the changes in one part of the world, even short distances, has little impact on their own. It is our duty as educators to help them make connections. During our recent inquiry ‘Sharing the Planet’ we spent time learning about the animals in the Artic. I told the children that the ice was melting and that the animals were losing their homes. It was the thought of the animals losing their homes that allowed the children to makes connections, curiosity and empathy for the animals. This naturally led to conversations as to the reasons the animals were losing their homes. It is at these early stages of education that we should begin to support the children’s understanding and knowledge of wider global issues. We are helping them in their first steps towards awareness of issues that will have a direct impact on their future lives and they have a right to know. Goal 14: Conserve and Sustainably Use Oceans. 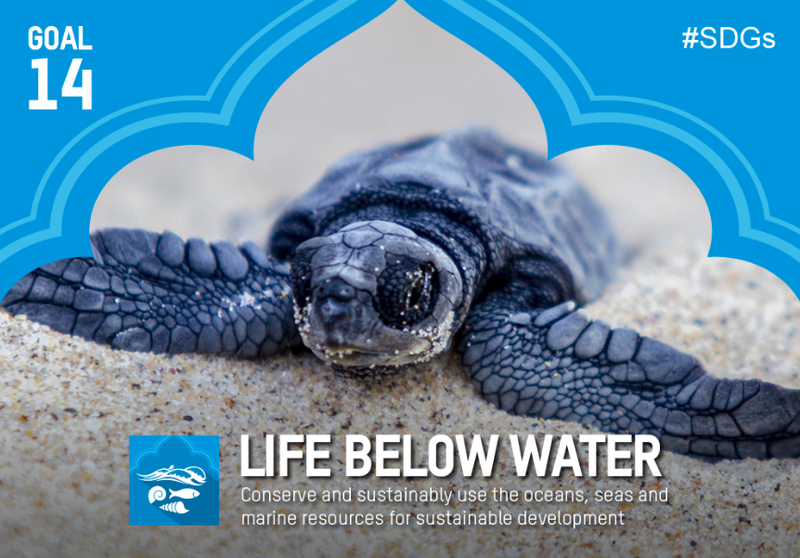 ‘Over three billion people depend on marine and coastal biodiversity for their livelihoods. However, today we are seeing 30 percent of the world’s fish stocks overexploited, well below a level at which they can produce sustainable yields. 63 million people live on India’s coastline. An overwhelming majority depend on the coast for their livelihoods and the rich biodiversity that keeps ecosystem secure. India is the second largest producer of fish in the world but fish catch is declining here too. Destructive fishing practices threaten the biodiversity of coastal areas and the livelihoods of an estimated 20 million people that rely on the seas for their sustenance. Sindhudurg , on the coast of Maharashtra is one of 11 ecologically critical habitats in India. The region is also a major fishing centre with over a 180 fishing villages. Its beautiful coastline is a three hour drive from the popular tourist hub of Goa making it an attractive tourist destination. 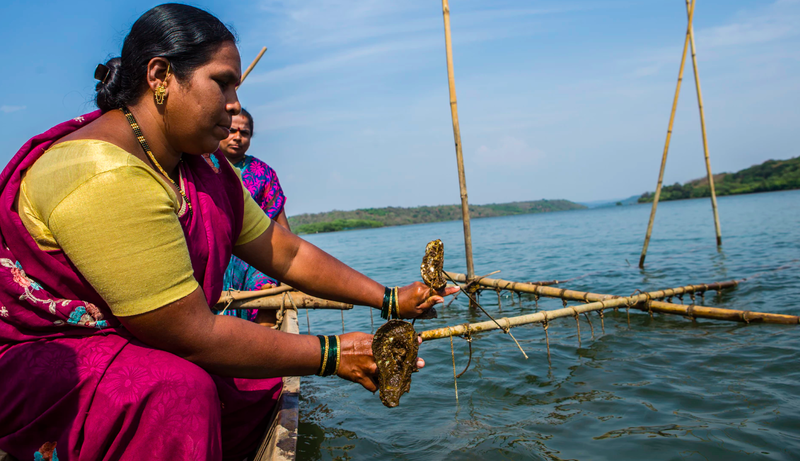 Since 2011, a UNDP partnership with the Ministry of Environment and Forests and the government of Maharashtra, is supporting efforts to conserve the enormous biodiversity wealth of the coastal area. The partnership is supported by the Global Environment Facility. The project has focused on building sustainable livelihoods for fishing communities. Close to 800,000 people in the area rely on fishing for an income. Community-based fisheries resource management has encouraged widespread adoption of several practices to enable sustainable fishing. This includes using devices that limit the by-catch (unwanted fish that are caught), and square mesh nets in trawlers protecting the oceans biodiversity. The project has also looked at ways to encourage alternate livelihoods for fishing communities, particularly women. In Wadatar village, women manage an oyster farm and sell oysters in the local market. Sindhudurg coastline is also home to many globally significant species like Olive Ridley turtles which are highly endangered. The project has empowered local communities to play an important role in conserving its rich heritage of biodiversity. Suhas Toraskar is one such biodiversity champion. 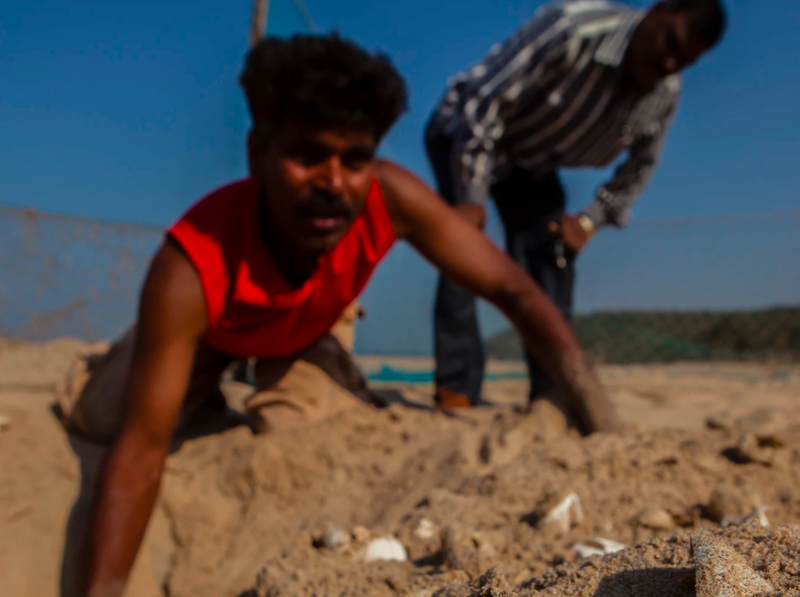 A fisherman, he plays the role of protector, guarding a nesting ground for olive ridley turtles. When the eggs hatch he carefully collects them from under the sand and releases them into the sea. 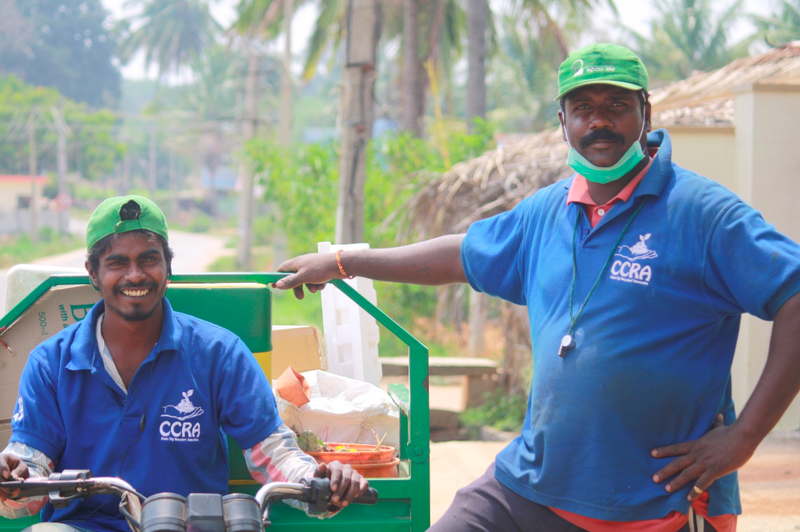 Because of people like Suhas, there has been a five-fold increase in nesting areas protected by villagers between 2011 and 2013, demonstrating that community action is key to protecting our biodiversity heritage. Although we live in a big city quite far from the nearest ocean their destruction and the subsequent killing of the many sea creatures is a topic that really connected with my young students. It seems that children have a natural attraction to the oceans, and water in general, so the news that we were polluting and killing the animals created genuine concern. It was through are discussions about the oceans and the use of plastic that stimulated the children into Action. 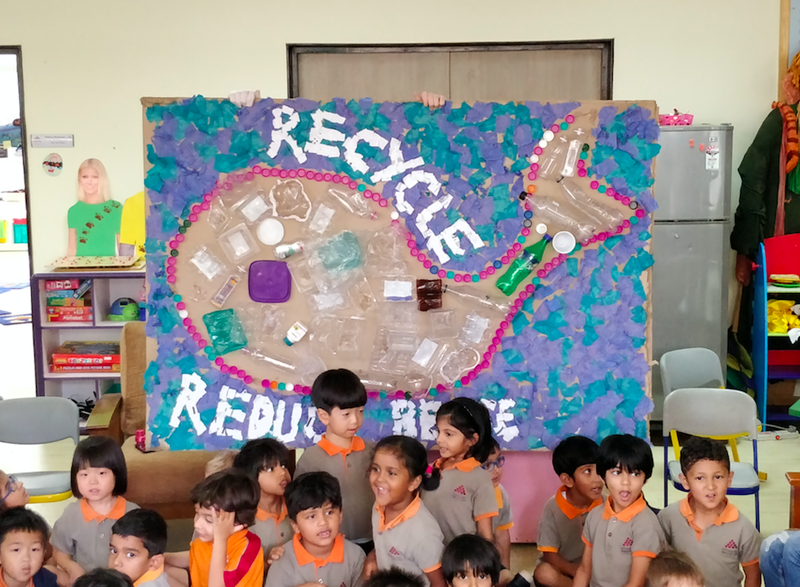 It was the start of receiving emails from parents as their children voiced their concern about the use of plastic bags and their recycling habitats. It was a clear change in mindset that I would hope for. A genuine demonstration of care and responsibility towards our natural environment. It would be my hope that this is a change in mindset that the children will take through life. A generation of responsible adults with a care of our natural world. Tropical forest cover in India has been reduced to two major areas: the coastal hills of the Western Ghats (about 55,000 square miles or 135,000 sq. km) and 14,000 square miles (34,500 sq. km) in Northeastern India. Very little of India’s forest cover is considered pristine. In recent years, the government has become more vigilant at protecting forest resources. The fundamental shift occurred in 1988 when India switched the focus of its forest policy from a production mentality to an environmental one and began taking steps to reduce illegal logging and encourage wood imports in an effort to conserve local supplies. Reforestation is encouraged and plantation coverage has expanded by 65 percent since 1990. 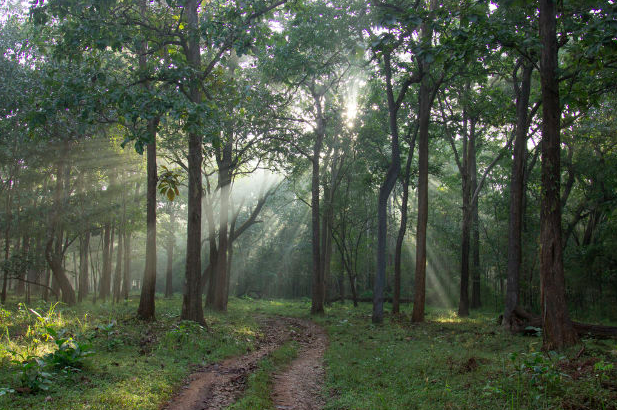 As a result of these efforts, total forest cover is actually increasing in India, although degradation of natural forest is still occurring, primarily as a result of subsistence agriculture, fuelwood collection, and cutting for construction materials. 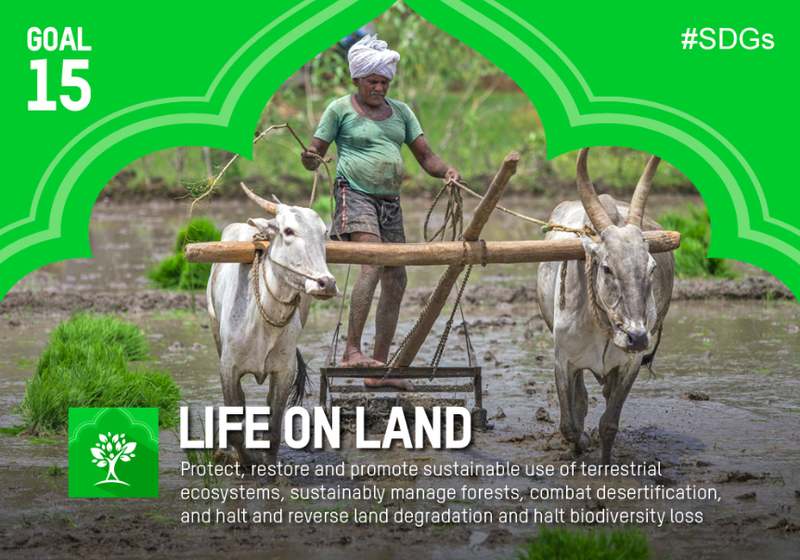 Deforestation is perceived to be the culprit behind a number of environmental problems from floods, to soil erosion, to desertification, and today India has a particularly active environmental movement, especially at the grassroots level. Currently about 5 percent of the country has protected status under IUCN categories I-V.
From a biodiversity standpoint, India has some 2,356 known species of amphibians, birds, mammals, and reptiles, of which 18.4 percent are endemic. Of these, 10.8 percent are threatened. The country is home to at least 18,664 species of vascular plants, of which 26.8 percent are endemic. Within our Early Years class the children have been busy researching an animal of their choice. Many children demonstrate a natural care and curiosity towards our animal friends. It was through this research that we discovered the many threats to both animals and habitats. It was alarming for many of the children to find out that the animal that they had so enthusiastically researched was now endangered through the actions of humans. 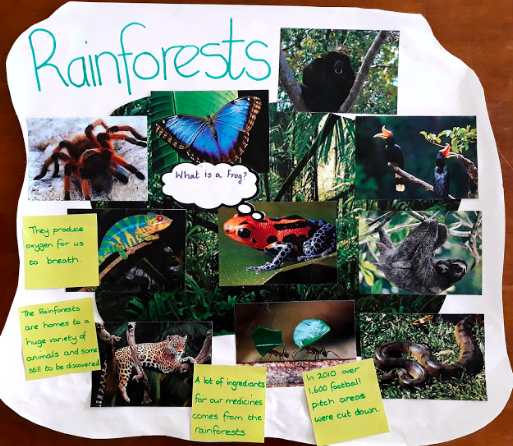 We also inquired about the human effects on the Rainforest and their importance to our daily lives. What I have thought during much of our work is how much to the children really understand. Do they really understand the implications? I suppose at this age the answer would be no but I do get the sense that they have an understanding that somethings is terribly wrong and that we can do something about it. In the end this is more than I could ask at this stage of their learning. We are creating the first steps in understanding and knowledge all through the topics that are of personal interest to them. This has been the success in helping the children make connections and changing hearts and minds. Education has been touted as one of the most powerful tools we can implement in our global efforts to promote world peace. The Human Rights conventions declare: “Education must prepare a child for responsible life and effective participation in a free society in a spirit of understanding, peace, tolerance, equality of sexes and friendships among all peoples, ethnic, national and religious groups and persons of indigenous origin.” Therefore with quality education, a child can learn the quality of empathy and understanding towards those who are different from them. And they may be more accepting of others and less likely to solve problems with violence. It seems that we have a unique opportunity within the Early Years setting to shape the future minds of the world and change attitudes towards the way we treat each other and ourselves. By developing a culture of mutual understanding and respect we can model peace, justice and fair treatment to our children. I started this article with little hope for the impact that can be made from early education but thankfully I was wrong. We are an important first step in developing and shaping young minds. The beginnings of a generation that wish to live in harmony with the world and each other. In the end it will be our students who are the future business and government. They are the generation with the most to gain or lose depending on our success now. It is vital that they have a knowledge and understanding of the issues they will face. We need to provide them with opportunities to take on key leadership roles in understanding, promoting and supporting efforts to help the world achieve the 17 Sustainable Development Goals. One key role that our students can play is helping to make sure others are aware of the 2030 agenda and its importance. The opportunities our fast-changing ‘globalised’ world offers young people are enormous. But so too are the challenges. Even very young children are already trying to make sense of a world marked by division, conflict, environmental change, and extreme inequality and poverty. Our learners are entitled to an education that equips them with the knowledge, skills and values they need to embrace the opportunities and challenges they encounter and to create the kind of world that they want to live in. We call this ‘education for global citizenship’. By definition, global citizenship involves engaging with distant places and different cultures, but this is never undertaken in isolation from our own lives and communities. The focus is rather on exploring what links us to other people, places and cultures, the nature and equality of those relationships, and how we can learn from, as well as about, those people, places and cultures. When I started to think about the Global Goals, and their magnitude, I was initially skeptical about the impact that I as an individual can make. After some reflection I realised that I can and do make a difference in small yet important ways. It is not about involving children in some huge action but instead it is about taking steps in their understanding of the world and the problems we face. We need to start somewhere and the Early Years classroom seems to be the perfect place. If we can make the smallest amount of differences here we will be involved in making a change in mindset of the future generations to come. All over the world actions are taken to make our planet more sustainable. Everyone can and should make a difference in our small part of this big world. The 17 Global Goals guide us all towards living fair, fulfilling and healthy lives on our one planet. That in itself is a pretty impressive and worthwhile ambition. As educators we play an important role in the successful completion of these goals. We must not be afraid to teach our young learners about ‘real-life’ Global Issues. We need to make a change and they need to make a difference! All over the world actions are taken to make our planet more sustainable. It is everyones responsibility and everyone has an obligation to be involved – no excuses. Brian Wibby, Michigan State University Extension, 2016. Lisa Dreier, Head of Agriculture and Food Security Initiatives. Kimm Murfitt, #TeachSDGs Ambassador and an Energetic National Board Certified Teacher. Arnaud Bernaert, Head of Global Health and Healthcare Industries. Saadia Zahidi, Head of Employment and Gender Initiatives. Alex Mung, Head of Water Initiative. James Pennington, Knowledge Networks Specialist. Bernice Lee, Head of Climate Change and Resource Security Initiatives. Alexandra Lopoukhine, Community Lead, civil Society and Innovations. Dominic Waughray, Head of Public-Private Partnership. Roberto Bocca, Head of Energy Industries. Margareta Drzeniek-Hanouz, Head of Global Competitiveness and Risks. Jim Hagemann Snabe, Chair, Centre for Global Industries. Global Movement for Children of Latin America and Caribbean. Emily Reynolds, How to teach the UN’s development goals, and why. Jack P. Shonkoff Investing in Early Childhood Innovation, 2015. 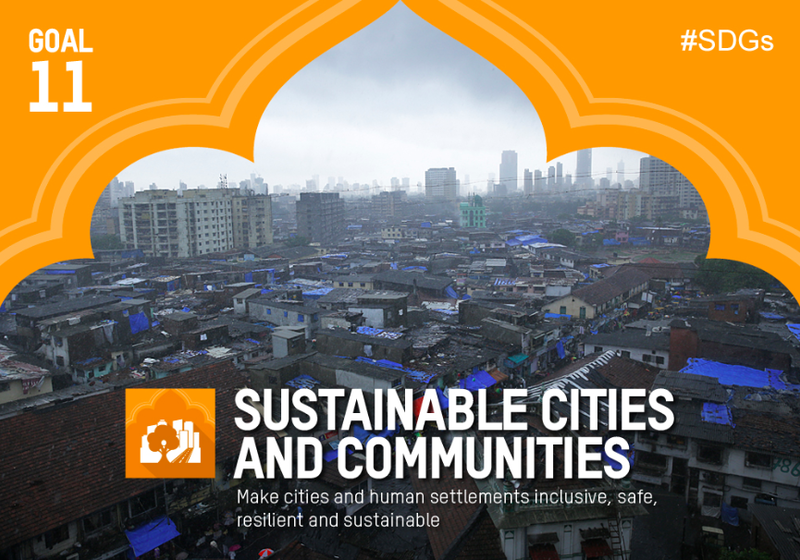 Stefan Dimitrijevic, How To Make Cities And Human Settlements Inclusive, Safe, Resilient And Sustainable? Second Urban Sustainable Development Goal Campaign Consultation on Targets and Indicators: Bangalore Outcome Document. Margarita Hakobyan, Here is Why The World Needs More Women Entrepreneurs. Swati Gupta, India facing its worst water shortage in history. We are living exciting times with regards to education. With the arrival of our new buzz word ‘Agency’ we are seeing educators give more value and recognition to the voice, choice and ownership of our students. Surely this should have always been good practice, but now it has a name, ‘Agency’. With this seemingly ‘new dawn’, I see bright days ahead for the education of our Students. But what do we really mean by ‘Agency’? This was a question I was puzzling over one day as I drove home from work. I suppose I had always considered ‘Agency’ in its simplest form as an approach to learning. Providing children with ownership and choice in their learning experiences. I began to ponder if this view was to narrow. Believing in a holistic education, I started to think about the concept of Agency and what this meant for the development of the whole-child. I started to think about the variety of ways that students could express Agency away from my narrow traditional learning concept which I had first thought. There has to be more to Agency than just an as an approach to learning? The freedom and independence to express our emotions is one of our first fundamental rights. Our classrooms should be a supportive and understanding environment in which our children can clearly express their emotions, take ownership and make a choice whether they are happy, sad, or excited etc. Our children’s demonstration of emotions should be encouraged, acknowledged and dealt with in an appropriate way. Suppressing negative emotions can cause depression, low self-esteem and in some extreme cases physical illnesses! The expression of emotion should be considered as opportunities for students to understand, celebrate, comfort and be empathetic to each other. Students should be made aware of their voice within a variety of social settings. This could be within their friendship group Are they equal owners when they engage in play? Are their friendships built on mutual respect and understanding? When collaborating with others do they take equal ownership in the activity? Do they have the ability to express their ideas in the decision making? Whether it be with their teacher, peers or family they have the right to speak and be heard. Students behaviour in certain social situations is often changeable but that should be by choice. They should be given equal ownership and voice within their interactions with others. Everyone has the right to celebrate and share their culture with others. Students should be made aware of this voice. They should be given a choice to choose their own cultural identity and express it in a way that is personal to them. Very important to our Third Culture kids. In our modern and technological driven world this is an ever increasingly important one. Students need to be given a choice in their technological use. To take ownership of its use and express their voice through it. Play must always be the ownership of the student. They must always be given the choice in their expression of play as this is their very first voice. Everyone should have ownership of their own beliefs. These beliefs should be personal and by choice. They should not be expected to adopt a set of beliefs but choose their own. And if they do they should have a place to share their spiritual understanding and have ownership of it. They have a choice to choose, a choice to change and a choice to adapt their spiritual beliefs because they are the owners. Many may choose not to have any spiritual beliefs at all but the choice is theirs. I think it goes without saying that the students should have ownership over their own bodies. Make choices about how they wish to use them. Some will run while some will walk. Students should have ownership of their environment. Not just in the classroom but more importantly in the natural world. Again this is a very important aspect as students’ voices need to be heard and respected when it comes to the future of our planet. They need to be given the choice and opportunity to make positive change. When I began to think of Agency in much broader terms than just learning, it gave me so much more hope for the future. By recognising and providing greater opportunities for my students to express their Agency in a broader sense I am in a better situation to support and develop the individual. The next generation must be made aware and given opportunities to express their Agency in a variety of ways. We must ensure that they have a voice and a choice and that they take ownership in all aspects of their lives. I have always been a bit obsessive with my documentation of both teaching and learning but it is something that is important to me. I believe that I owe it to the students to document their learning journey as much as possible. Also, providing meaningful documentation has many benefits to both the teaching and learning in the early childhood classroom. Documentation is not only a way to track students’ learning and thinking but also a resource that should have an effect over future planning. When done correctly, documentation should take the viewer on a journey through the children’s learning journey highlighting their development and the challenges they faced on the way. A documentation of their thinking process as well as their learning experiences. When children can visually see that their thinking and work is valued so much that it is documented and displayed proudly, they take pride and ownership over it. Visible documentation may also serve to generate new ideas and areas of learning. Documentation should have a purpose that helps to support the teaching and learning. This may include documenting students’ achievements, highlighting areas of support, driving future learning or reflecting on practice. Whatever the purpose, I believe that it should be the driving force of both the teaching and the learning. Detailed documentation is important for teachers to be able to track students’ ‘learning and thinking’ in order to plan next steps, how to scaffold children’s learning experiences and how to personalise learning experiences. Even for the visitors to our classrooms, documentation provides an insight into the learning. The learning taking place and the process by which it is achieved should be clearly visible. They should be able to see what the children are interested in and learning about, the thinking that has taken place and the journey they have been on without having to ask. It should provide a showcase of personalisation of the children in our class. A focus point for observation and discussion. At the front of my classroom our inquiry board has been transformed into a visible journey of learning and thinking. The board is littered with post-it notes showing the development of the children’s ideas and thinking through our inquiry. 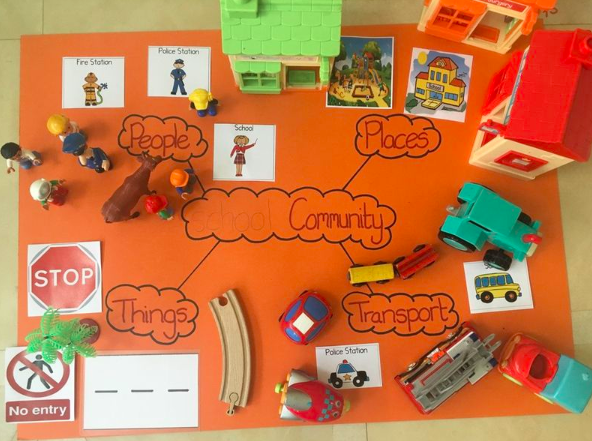 In the Early Years, I try to include as many visuals as possible so that the children can easily make connections and access the learning. Although the children are unable to read the notes themselves they take delight in their ideas being recorded. It gives value to their participation and thinking. I also use the notes to reflect back on past learning, reminding the children of their ideas and then developing them further. This approach has been a real driving force in our inquiries. The visual documentation provides information about children’s learning and progress within an inquiry. The focus is on how children make meaning and how they came to understand. While teachers often gain important information and insight from their own first-hand observations of children, documentation of the children’s work, thinking and contributions to learning in a wide variety of media provides compelling public evidence of the intellectual capability and competence of young children. Documentation uncovers the learning process as it highlights children’s theories, interests and relationships. The documentation of the children’s conversations or thinking is used to present children’s words as serious attempts to understand concepts and ideas. On another class inquiry board this evidence of ideas and progression in thinking is made more evident. The children’s questions and ideas about a topic have been displayed. The board has been added to each time the children progressed and developed in their thinking and learning. String was attached to various ideas when we began to make connections between the ideas or topics. As an observer of the board you could quite easily begin at a question and follow the pattern of thinking and learning all the way to its conclusion. As I work within an inquiry-based curriculum I find it extremely helpful, both for myself and the children, when I document and make visible our learning journey throughout each of our inquiries. For each inquiry, I document each stage of our learning journey using an adaption of Kath Murdoch’s inquiry-cycle. I have found this very useful as it provides the children with a visual documentation of activities, learning and ideas throughout our inquiry. It also helps me with keeping track of our learning and next steps in lesson planning. Something that takes pride of place on our inquiry-cycle is the documentation of Actions taken by the children. The children take pride in the accomplishments as their photos or samples of learning are placed upon the board. The celebration and documentation of achievements encourage other children in the class to take Action. 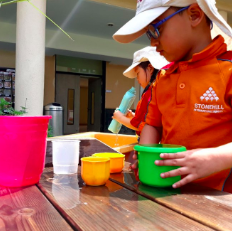 ‘Taking action is an integral conclusion to the learning that incorporates students making connections to what they have learned, applying a variety of real life skills’ (IBPYP). Even our youngest learners are capable of meaningful Action and this needs to be made clearly visible within our classrooms as documentation of achievement and celebration and also as encouragement to others. This is one of the most important parts of the learning journey that should be documented and celebrated. Allowing your classroom to become an environment of visible displays of thinking and learning you provide stimulus for the children to independently reflect and make sense of their learning journey. The displays create an environment that celebrates work, thinking and learning. It gives value to the children’s contributions to learning. Making them a visible part of the process. Children become even more curious, interested, and confident when they are able to think about the meaning of what they have done. 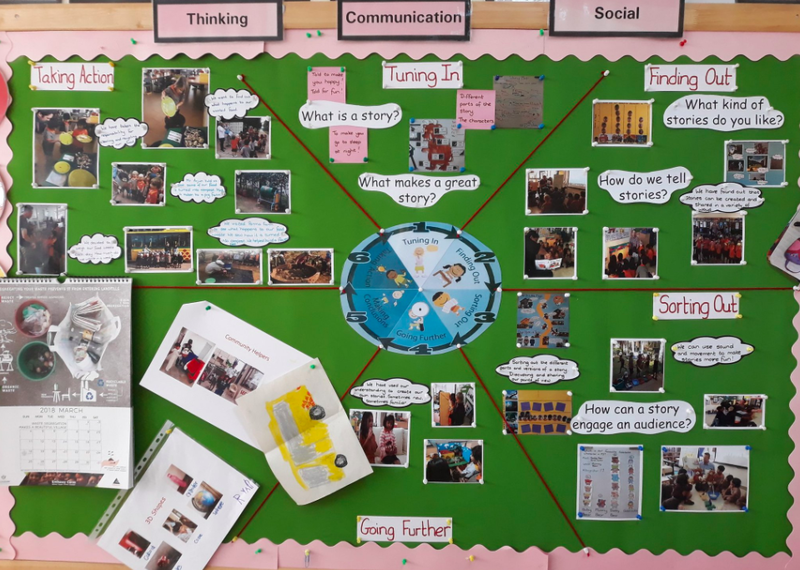 A display documenting the work of one child or of a group often encourages other children to become involved in a new topic and to adopt a new method of doing something. Children also learn from and are stimulated by each other’s work in ways made visible through the documents displayed. They provide stimulus for fresh ideas and encouragement to more reluctant learners that begin to see value in the thoughts and ideas displayed. The processes of preparing and displaying examples of the children’s experience and effort provides a kind of debriefing or revisiting where new understandings can be clarified, deepened, and strengthened. 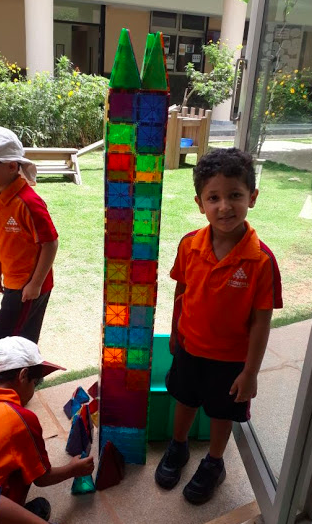 The careful effort that we place in the creation of displays demonstrates to the children that their efforts, intentions and ideas are taken seriously. What may not seem valuable to you is extremely valuable to the children. We must ensure that we treat each piece of work or idea as a masterpiece. Doing otherwise would only discourage the child from making further contributions or effort in the future. I have been fortunate to work with some fabulous art teachers during my career who have highlighted how the most obscure piece of work can be enhanced and valued by the time we take to display it correctly. 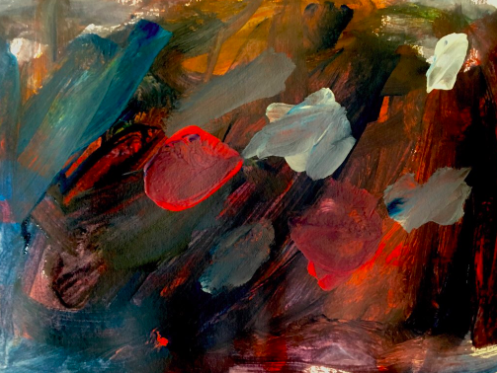 What might seem like a random mixture of colours and blobs is the demonstration of the children’s independent thoughts, effort and reflection of learning. The painting on the right is a reflection of child’s learning into the problems of plastic in our oceans. “It’s plastic in the ocean,” said a confident child to the art teacher. It is not just a random mash of colour and blobs. It is a representation of a child’s thoughts, thinking and learning and must be treated and valued as such. Displays should not be intended to serve for decorative purposes but purposeful documentation encourages children to approach their work responsibly, with energy and commitment. This allows for the children to show delight and satisfaction in both the process and the results. 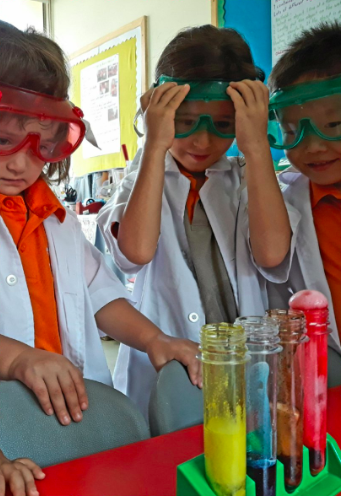 Through careful examination of the children’s work and the documentation of it a teacher is able to fully understand the children’s development and learning. Without this clear picture of the children’s journey, including successes, challenges and failures, how can it be possible to personalise support for our little individuals? Each of their journeys will be different. Each will face individual challenges whether they be academic or social. We owe it to them to record meaningful and purposeful documentation that will provide a basis for developing teaching strategies to provide individual support. Through this documentation we will gain a deeper awareness of each child’s progress and pitfalls. We need to know where and how to support. Using this information, we are able to make informed decisions about appropriate ways to support each child’s development and learning. Detailed documentation highlights both issues and successes of our young learners. In the modern world of technology we have a wide variety of tools at our disposal to be able to document learning as it happens. A particular tool that I have found useful this year has been the use of the online portfolio Seesaw. This provides invaluable opportunities to document authentic learning moments and the learning journey of each individual child. 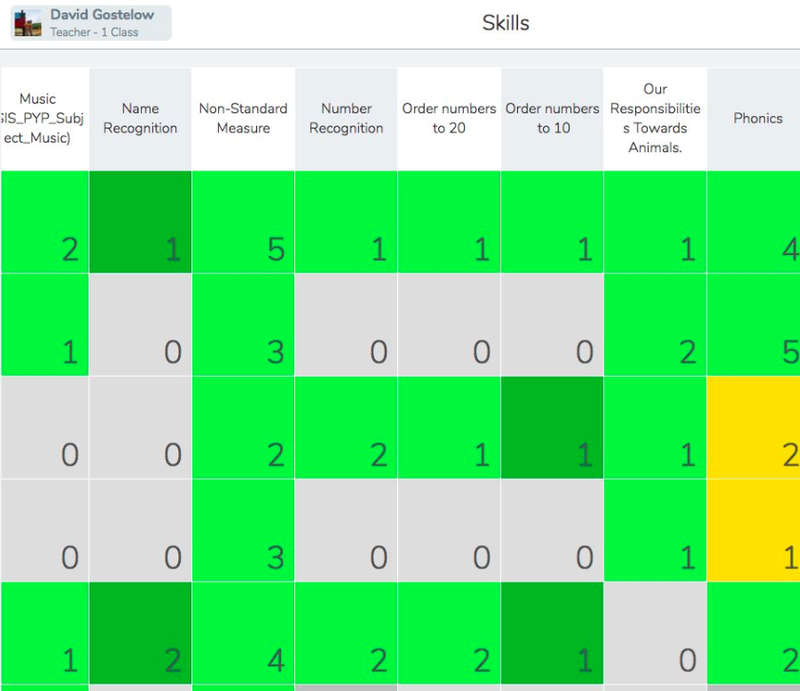 This year I have been using the skills function as a formative record of the children’s learning. This has provided me with instant access to the children’s learning across the curriculum. Having such a visual record has allowed me to personalise the learning for each individual child. With an extensive yet purposeful documentation of children’s learning I am able to plan accordingly based on the evaluation of the learning as it progresses. It allows me to make informed decisions that has the ability to change my planning so that it best supports the children’s needs. I am a big believer in having flexibility in my teaching so that I can change and adapt to meet specific learning needs. Planning decisions can be made on the basis of what individuals or groups of children have found interesting, stimulating, puzzling or challenging. Documentation provides me with the ability to place personalised learning at the heart of my teaching practice. Most experiences and activities should not be planned too far in advance so that new aspects of learning can emerge based on the children’s interests or needs. It is important that we reflect on the work in progress and the discussions that surrounds it. This may lead us to consider possible new directions that the learning may take. Clear and detailed documentation provides an ongoing planning and evaluation that should be achieved by all the adults who are responsible for the learning of the children. Believe it or not the parents are usually the last thing on my mind when it comes to documentation. I truly believe in teaching for the children and and do not try to consider the expectations of the parents in my teaching or planning. However, with detailed documentation you can often satisfy the expectations of the parents and even when in times of disagreement the documentation can be used to support opinion. An indirect consequence of using the Seesaw portfolio has been that parents have instant access to the children’s learning journey as it happens. If used correctly, they can witness any academic or social developments their child takes with just a touch of a button. This makes it possible for parents to become greatly aware of nearly every aspect of their children’s experience at school. Parent’s feedback on Seesaw and other media can also contribute to the value of documentation.